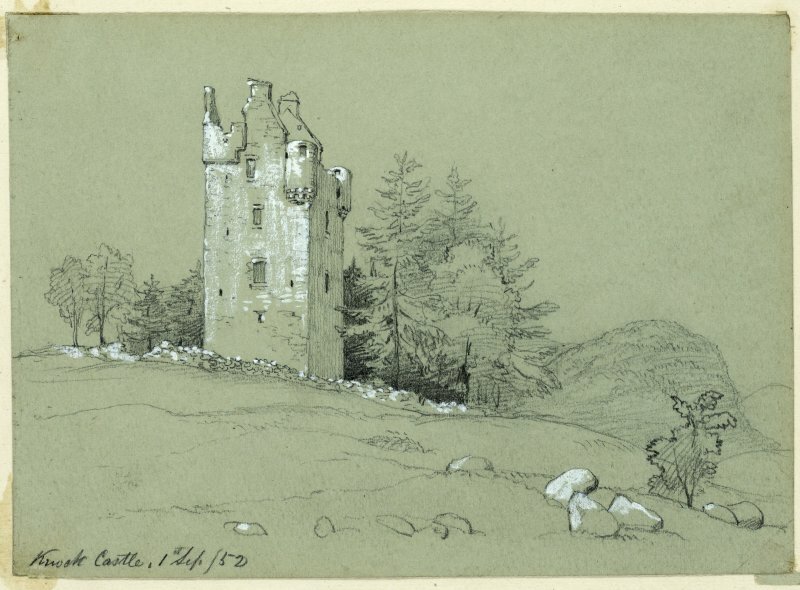 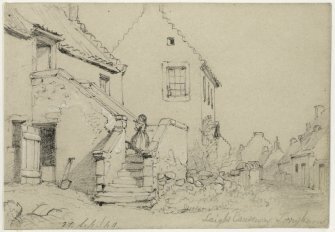 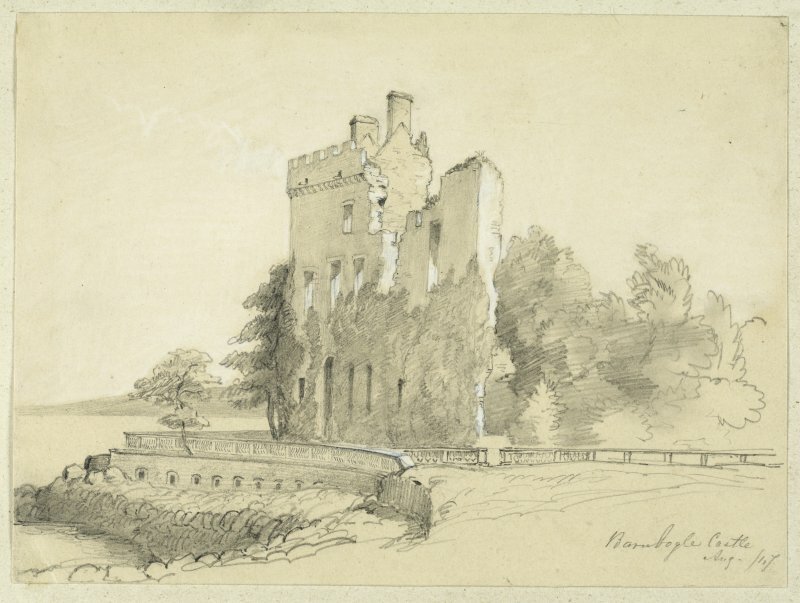 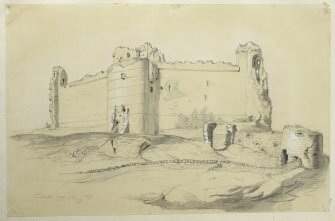 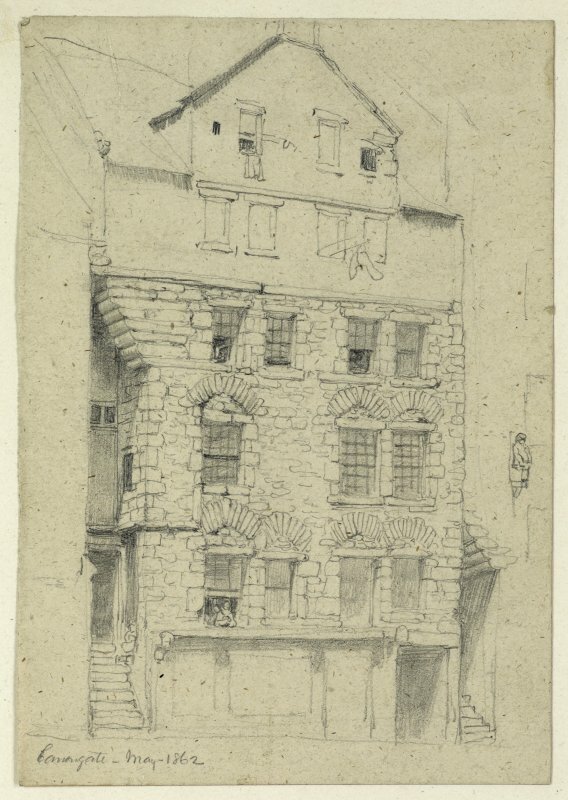 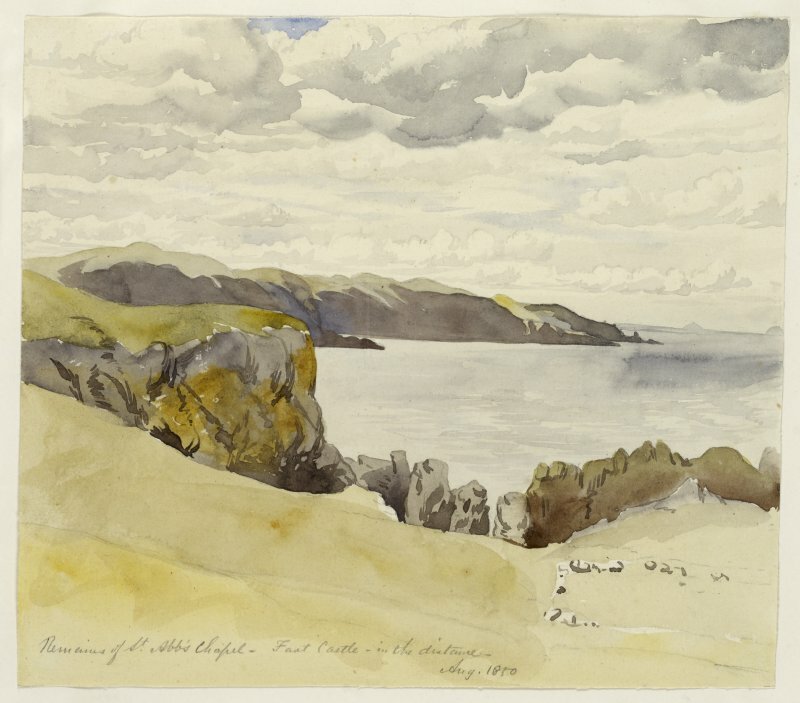 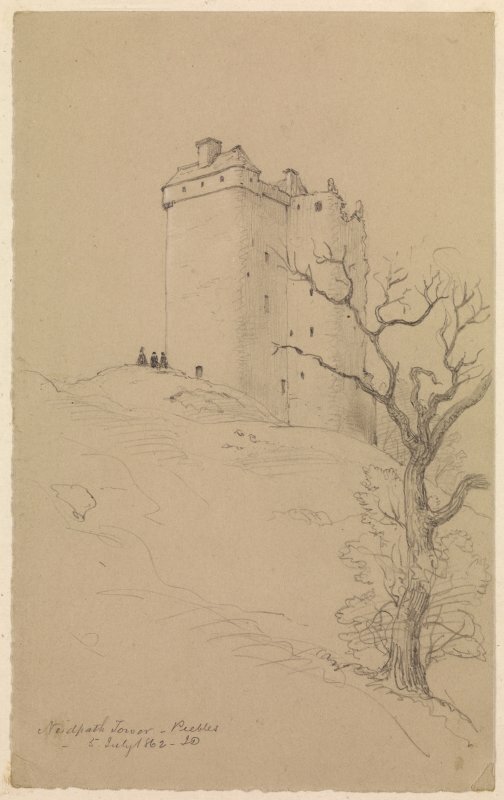 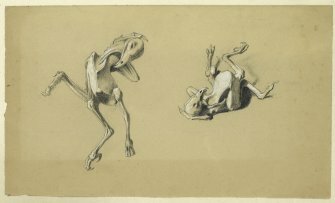 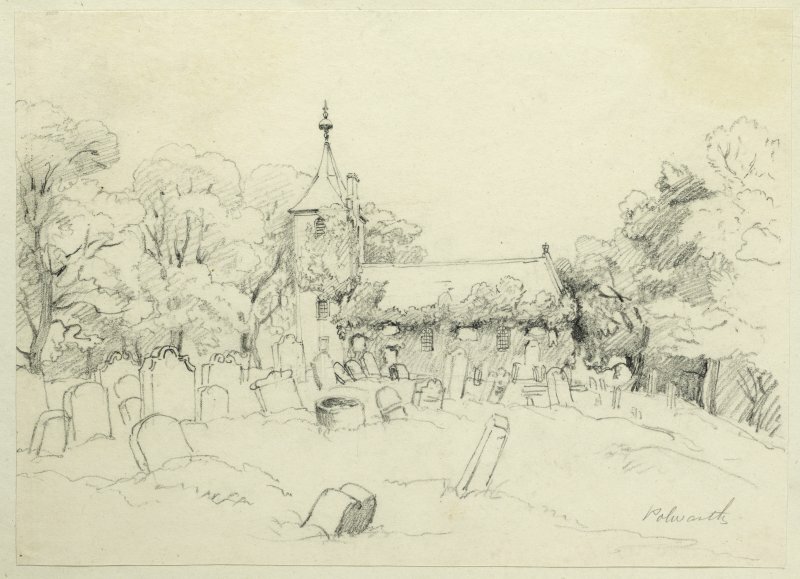 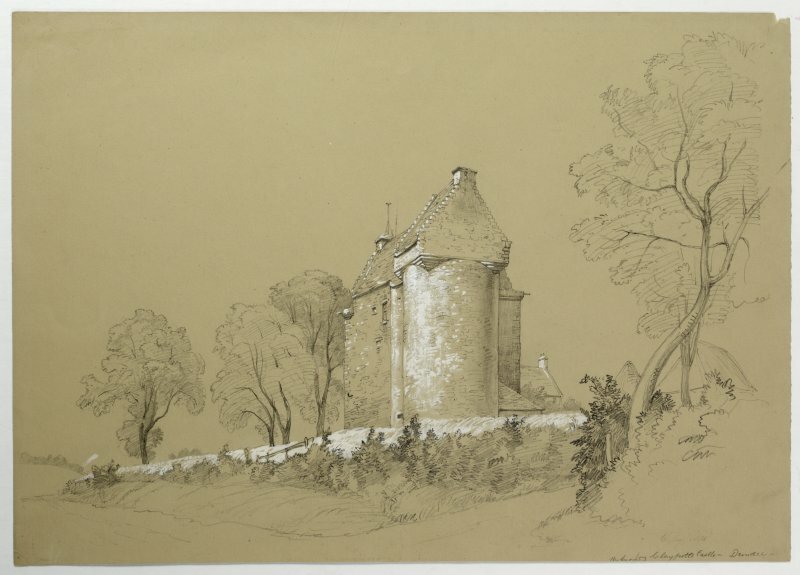 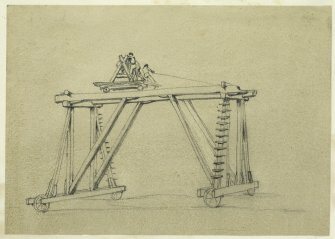 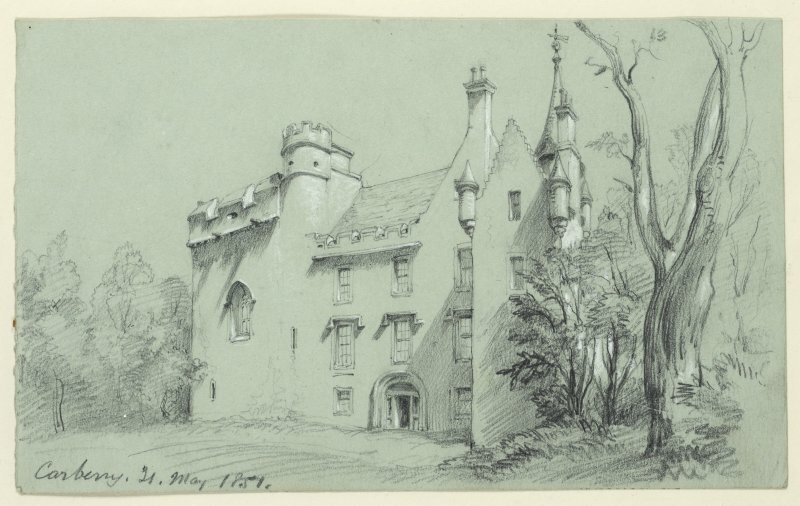 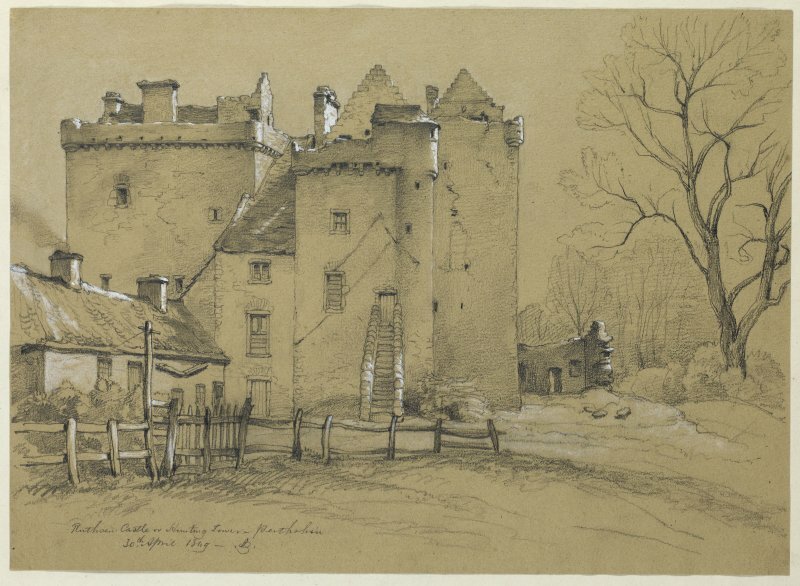 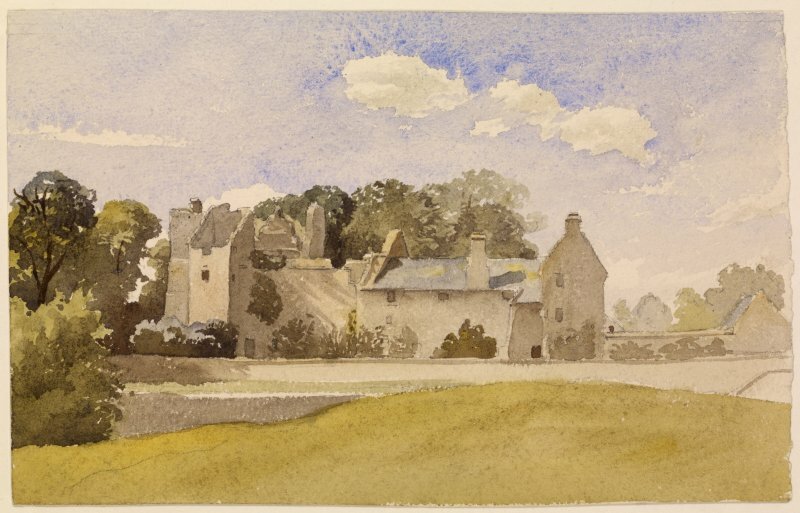 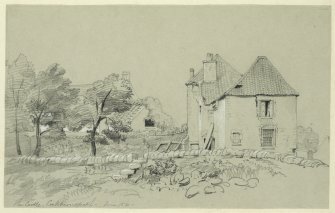 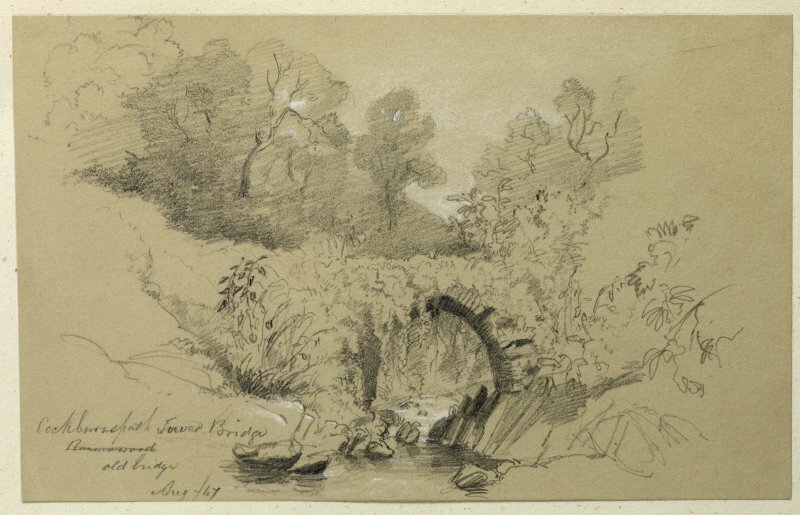 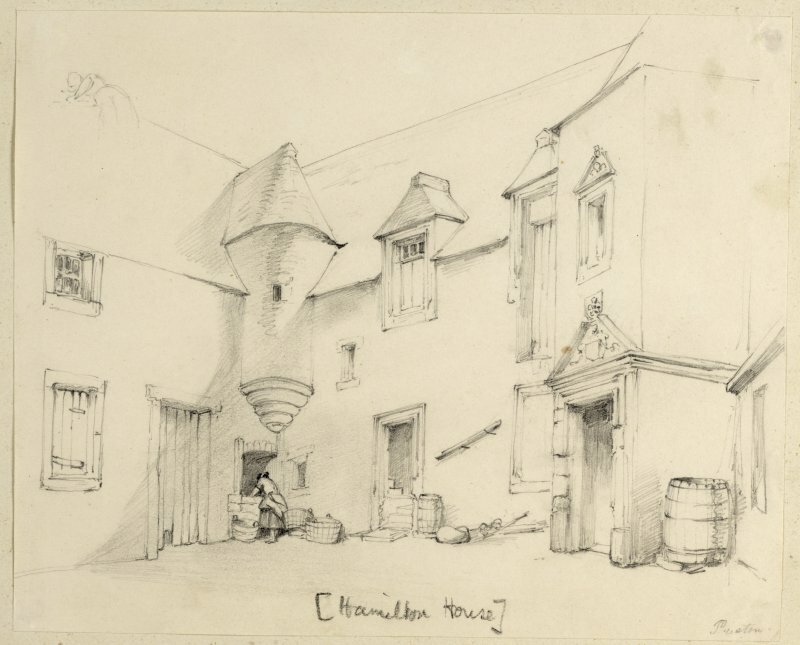 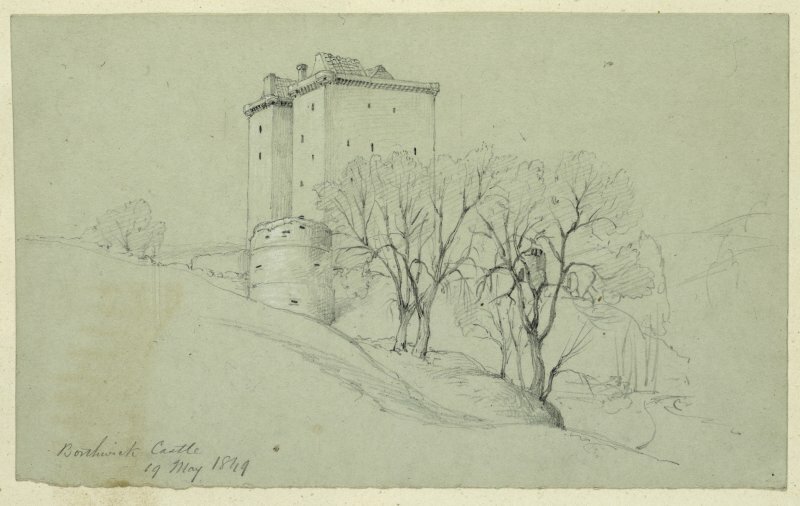 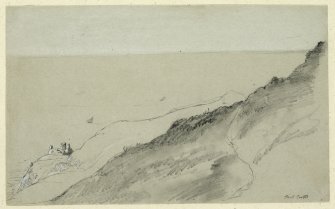 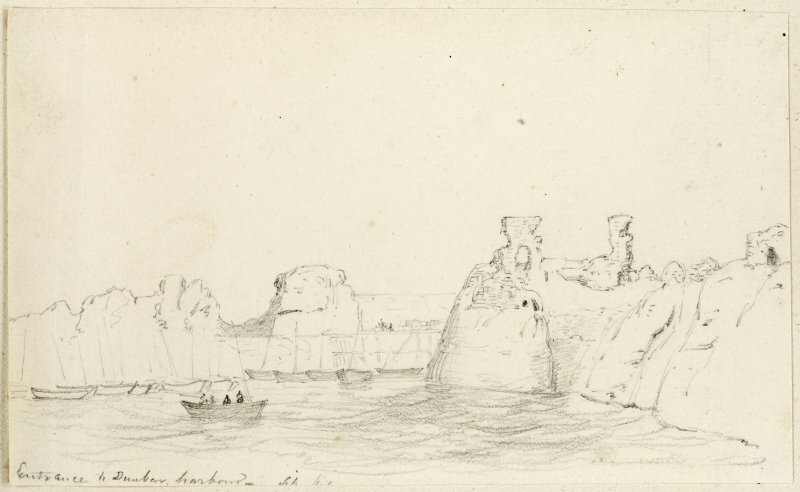 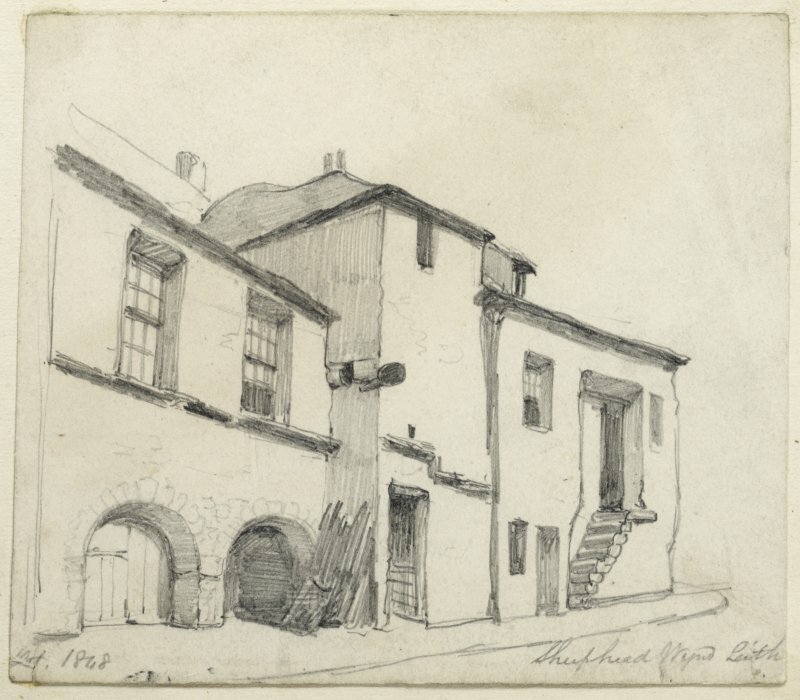 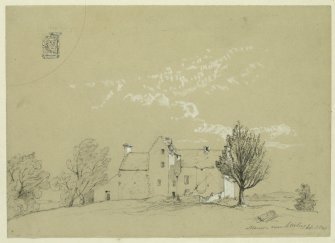 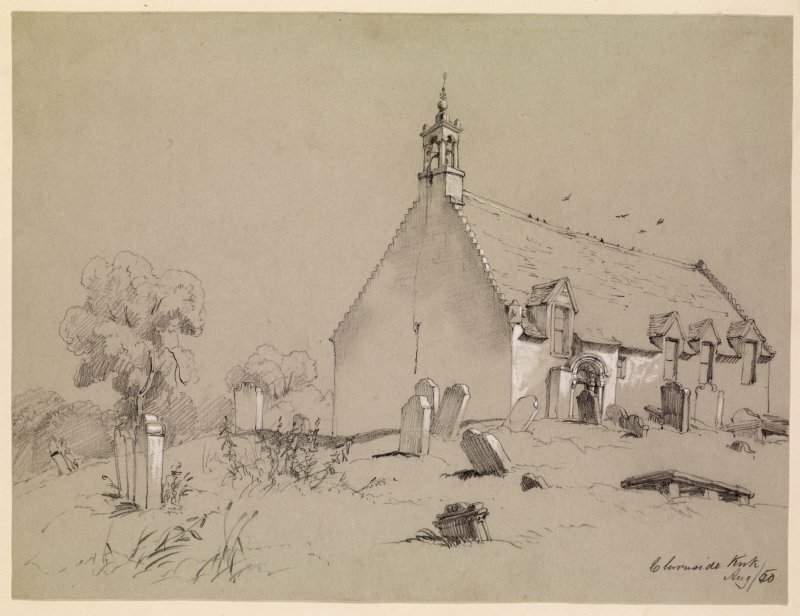 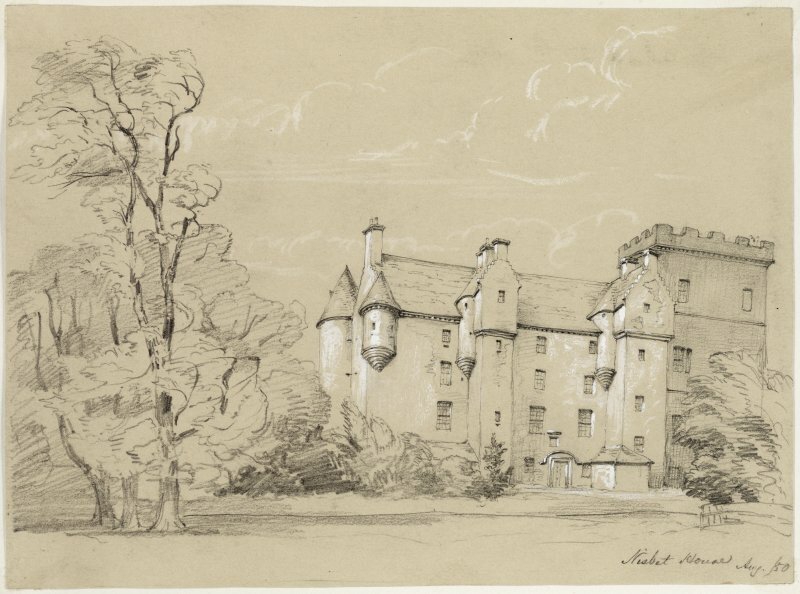 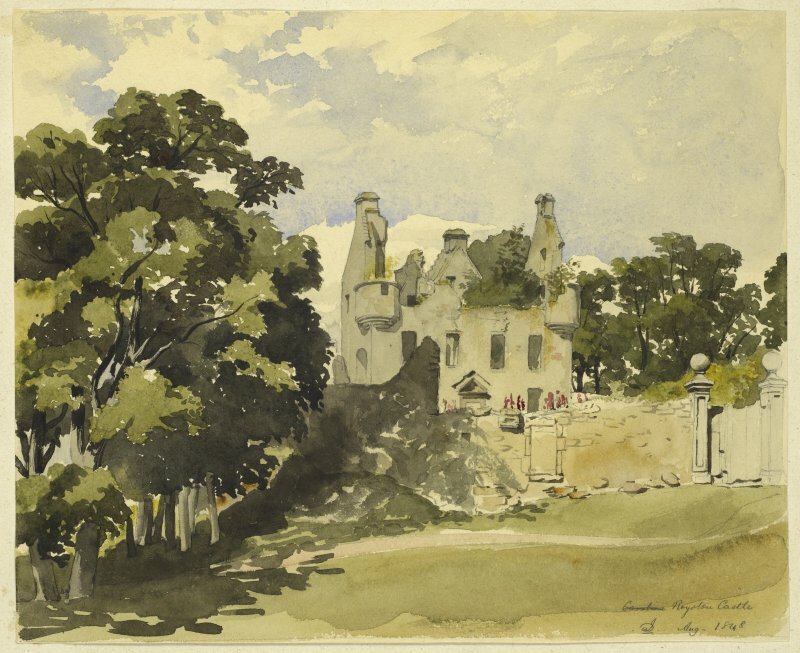 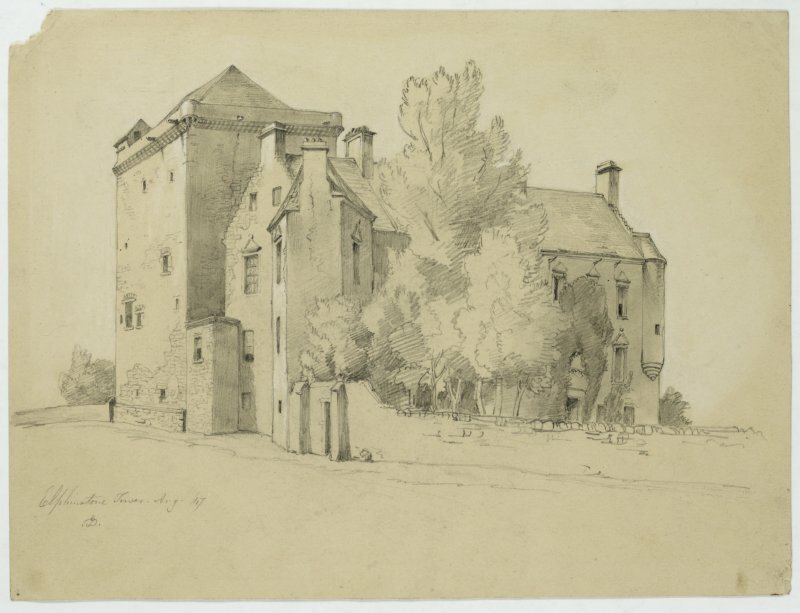 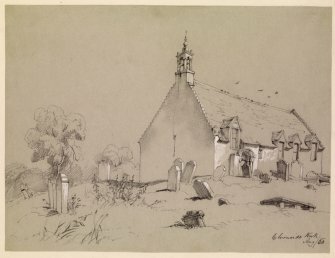 As part of their final project RCAHMS Skills for the Future Trainees, supported by Heritage Lottery Fund Scotland, have digitised an album of drawings by James Drummond. James Drummond (1816–77) was a renowned artist and antiquarian. 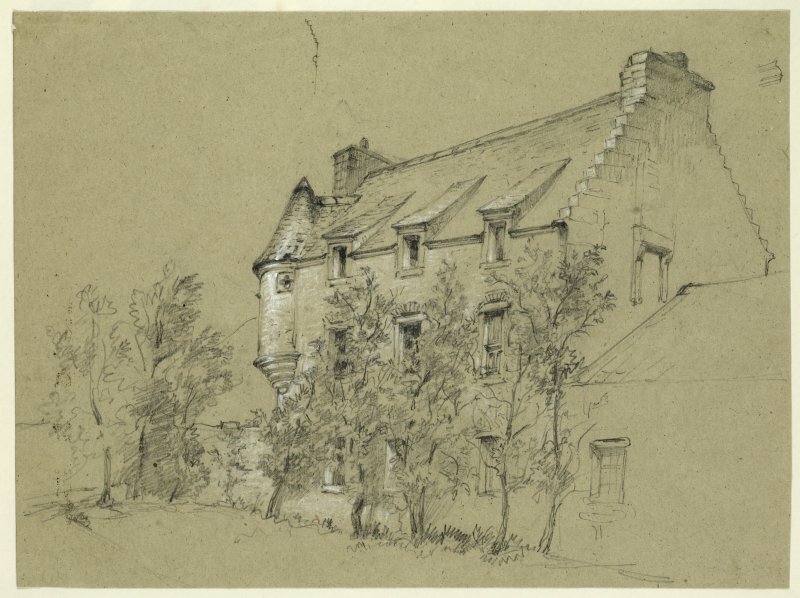 He was born in Edinburgh at John Knox’s House and trained as a draughtsman. 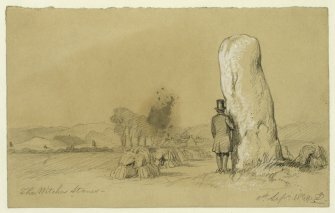 Drummond is most well known for history paintings such as The Porteous Mob (1855), held in National Galleries Scotland. 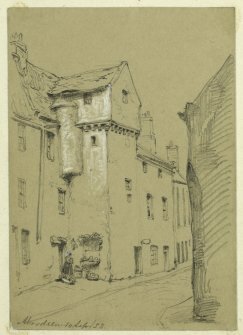 In 1848 he became a member of the Society of Antiquaries of Scotland, later a member of Council and Joint Curator of the Museum. From 1868 until his death in 1877 he was also curator of the Scottish National Gallery. Drummond published numerous articles on antiquarian subjects, such as Scottish Mercat Crossses, and posthumously, many of his drawings were published as Sculptured Monuments in Iona and the West Highlands and Old Edinburgh. 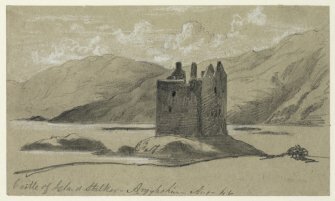 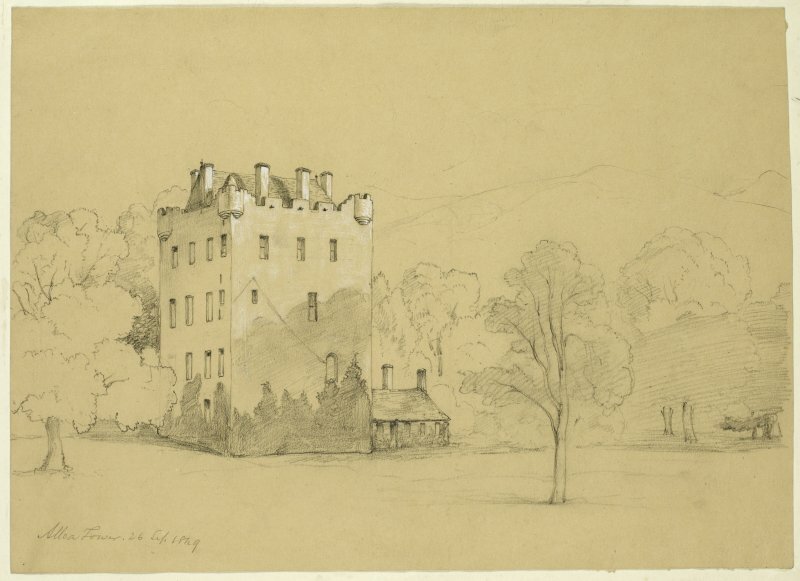 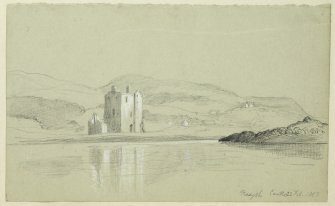 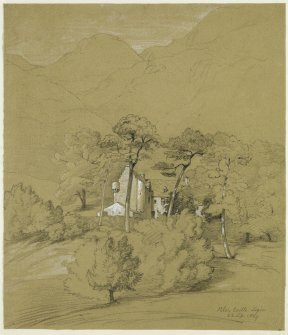 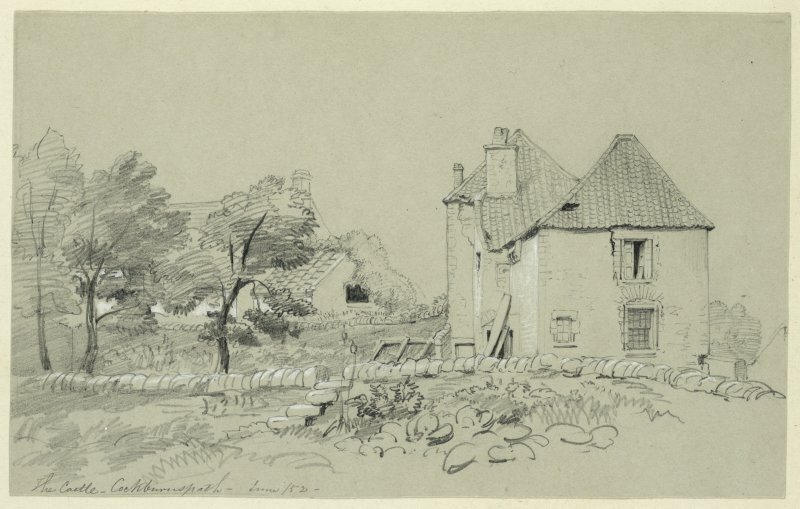 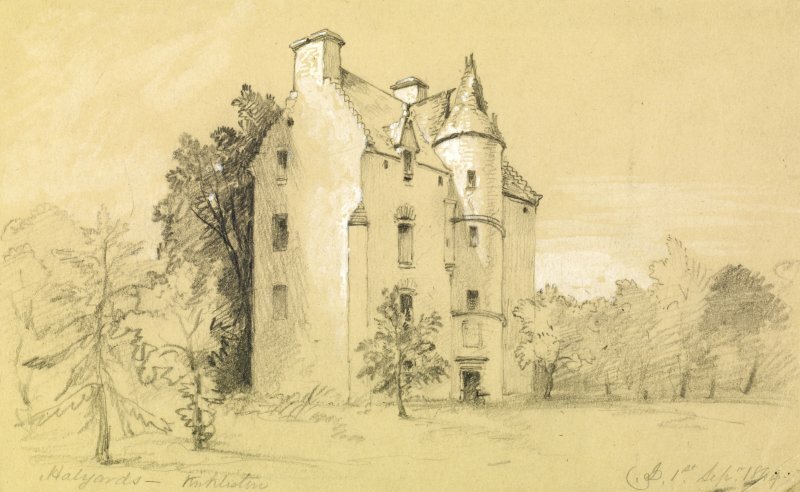 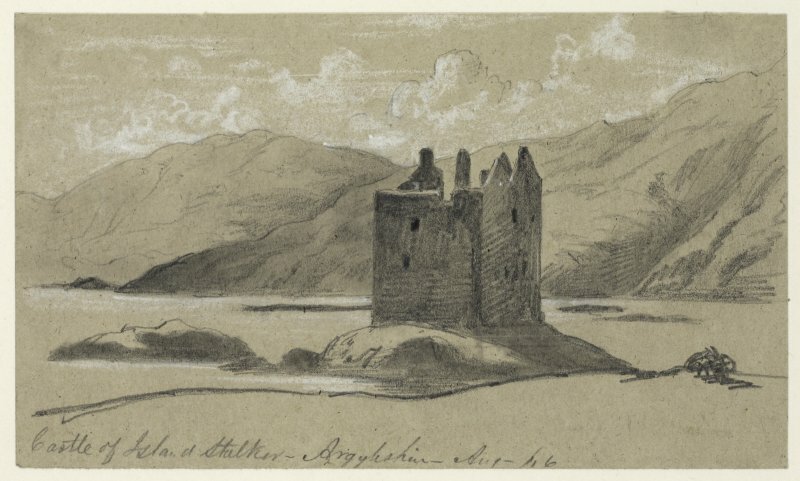 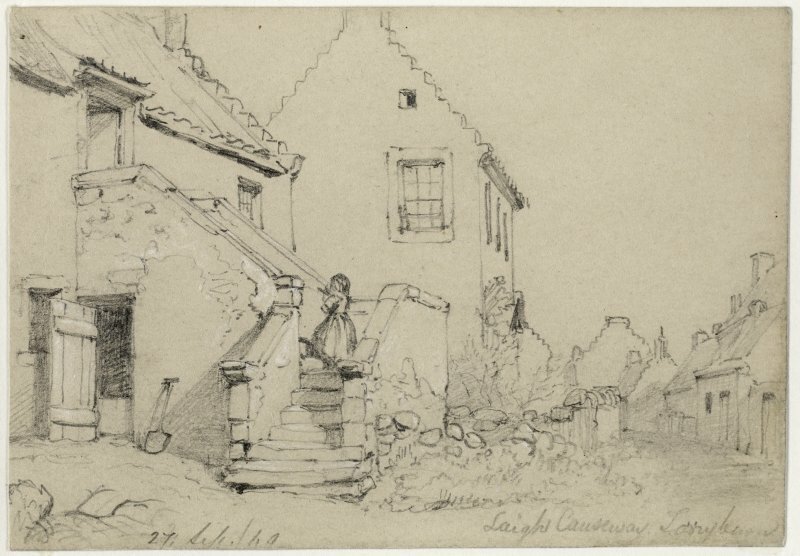 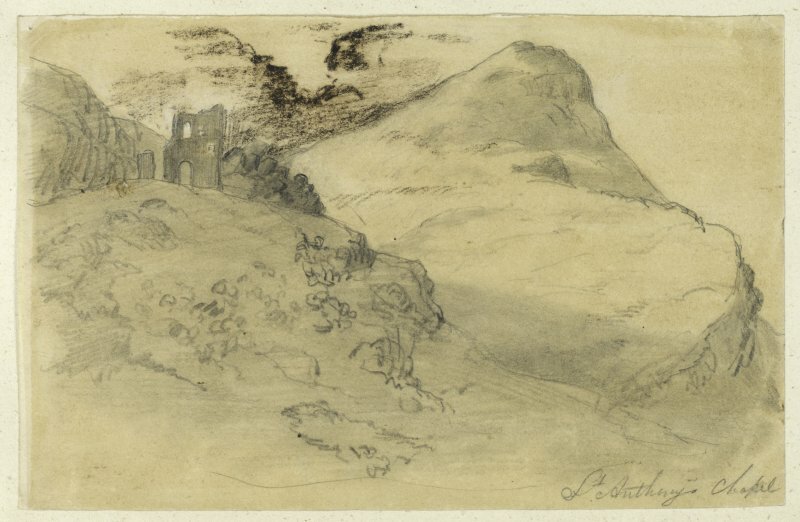 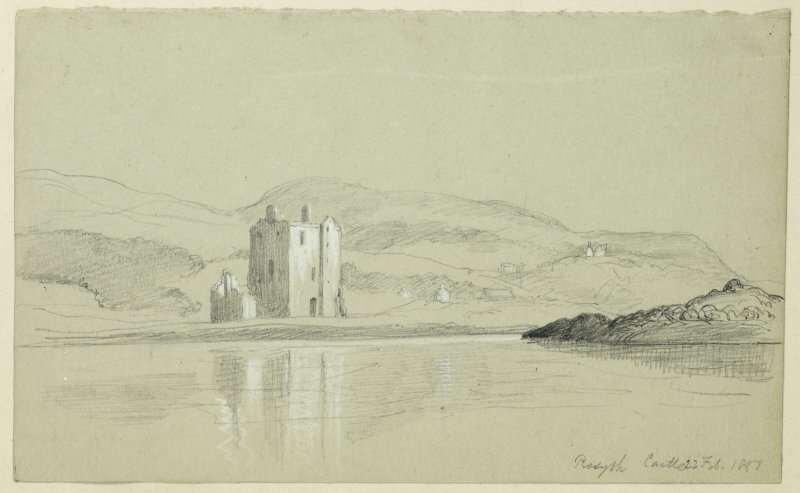 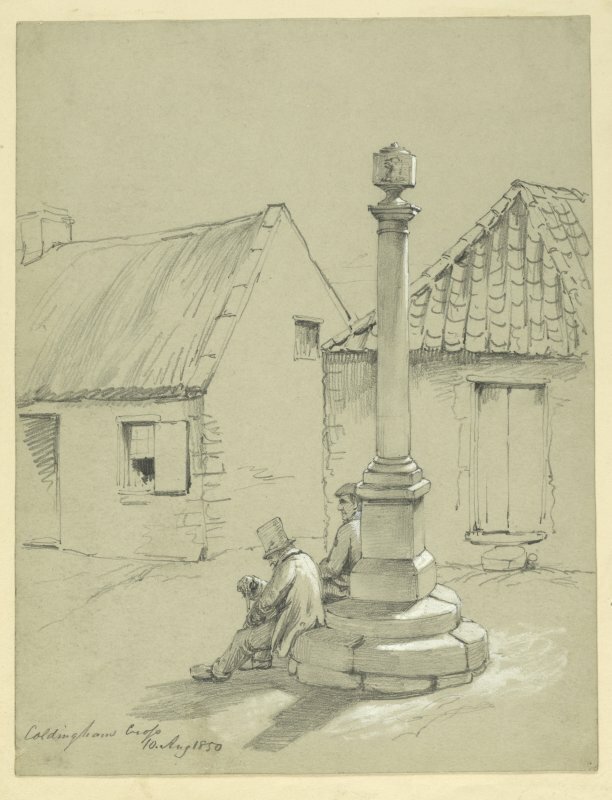 The collection at RCAHMS includes original sketches reproduced in these publications. 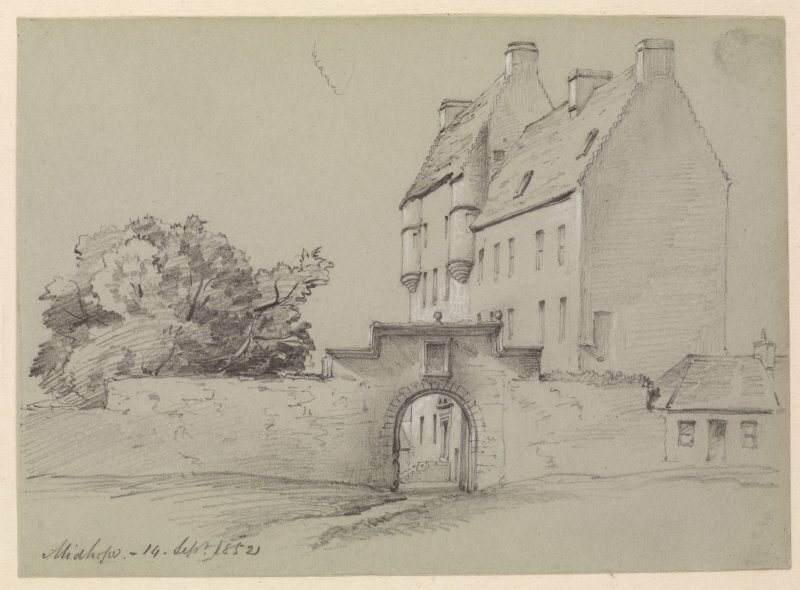 The Drummond Collection was deposited at RCAHMS in 1975 as part of the Society of Antiquaries of Scotland Collection. 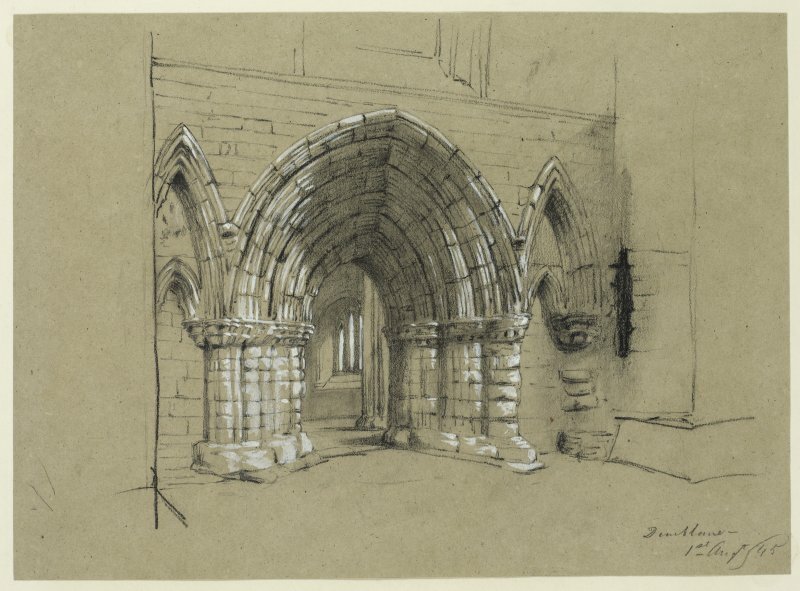 It comprises an array of drawings and watercolours of archaeological and architectural sites throughout Scotland. 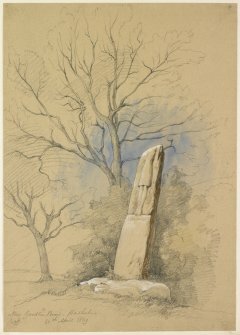 The sites drawn by Drummond range from Dirleton Castle in East Lothian to standing stones such as Clach A’ Charra in the Highlands as well as a large number of mercat crosses. 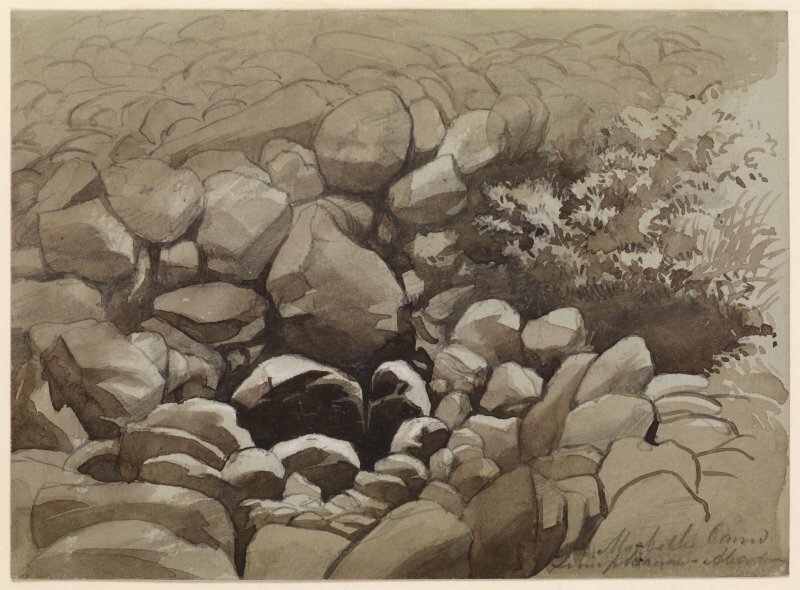 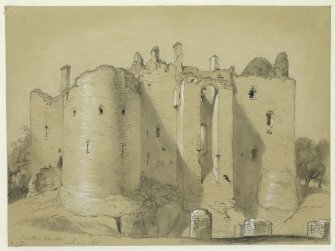 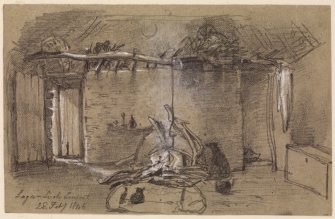 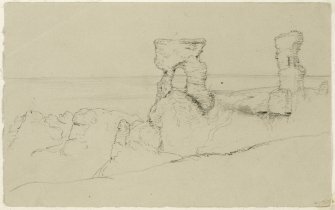 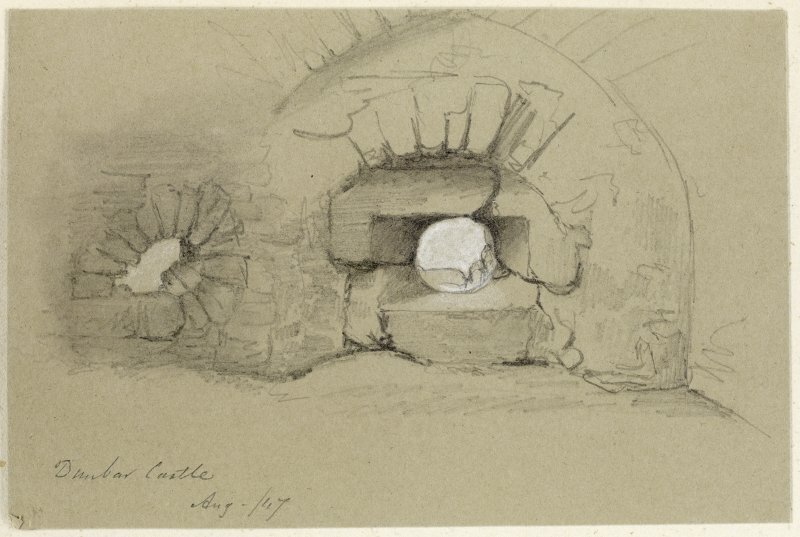 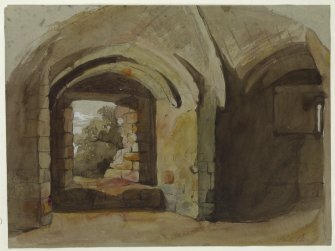 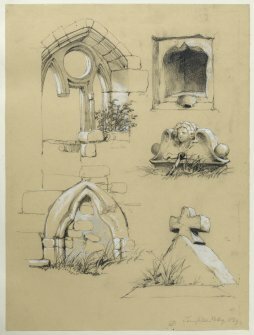 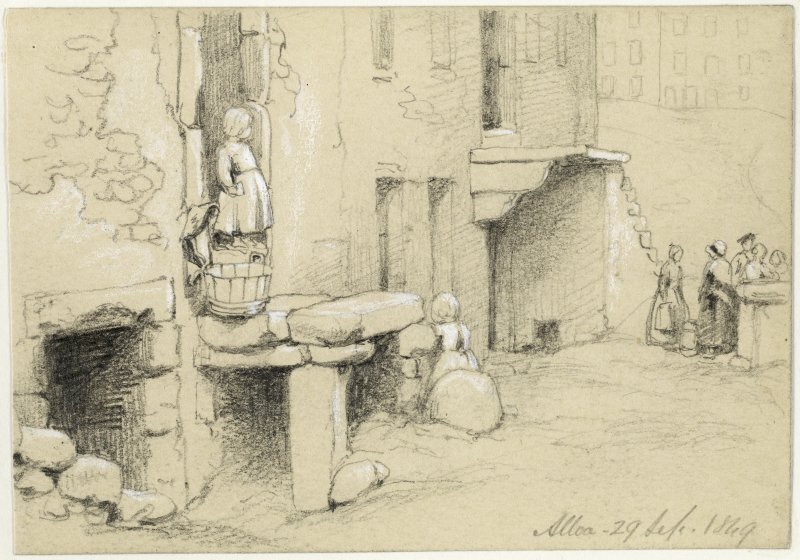 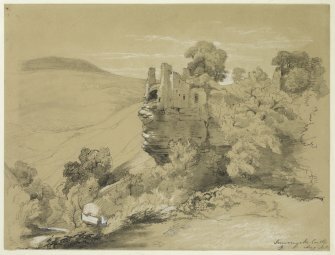 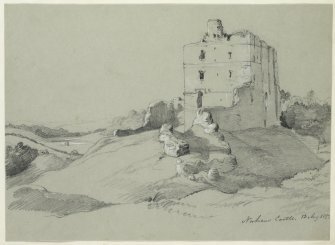 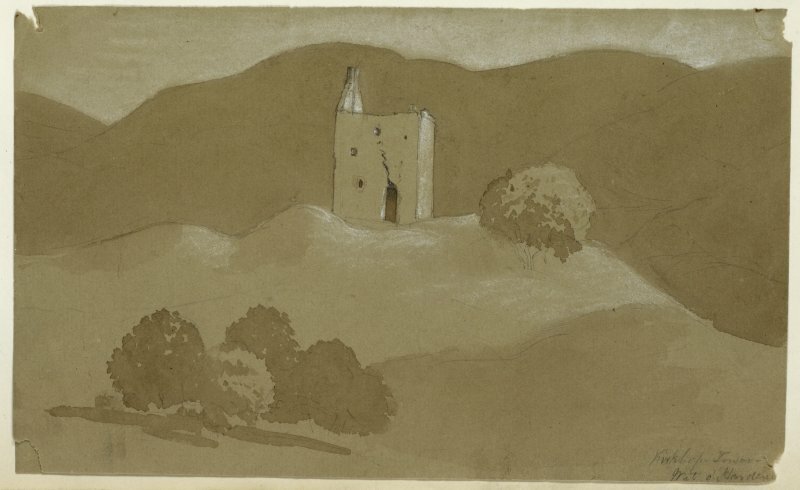 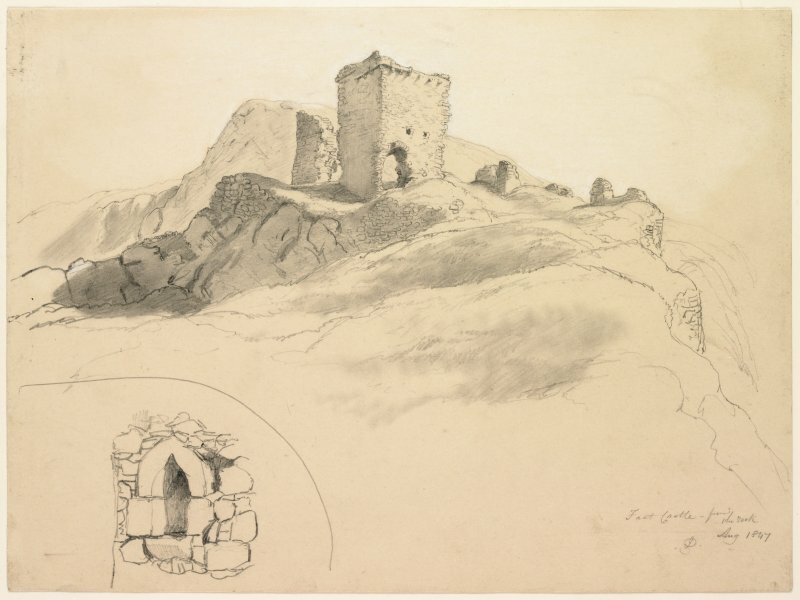 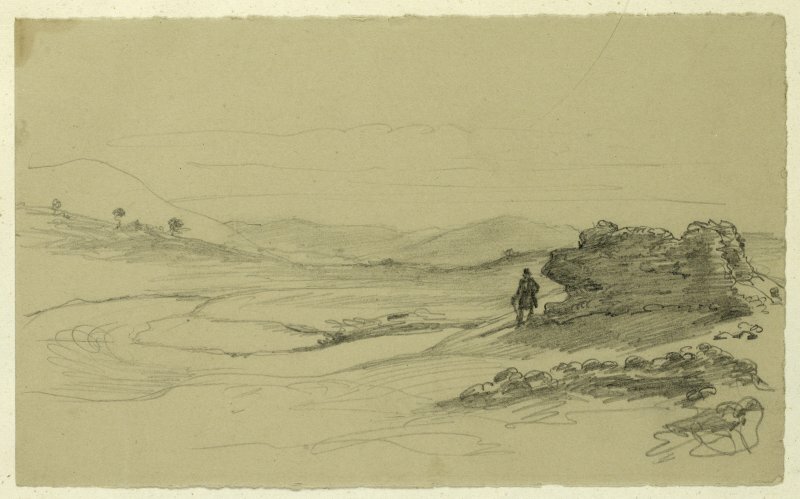 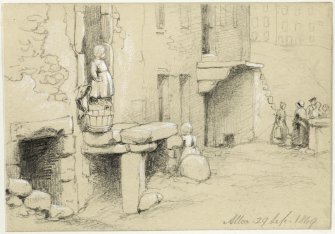 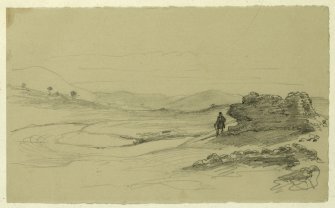 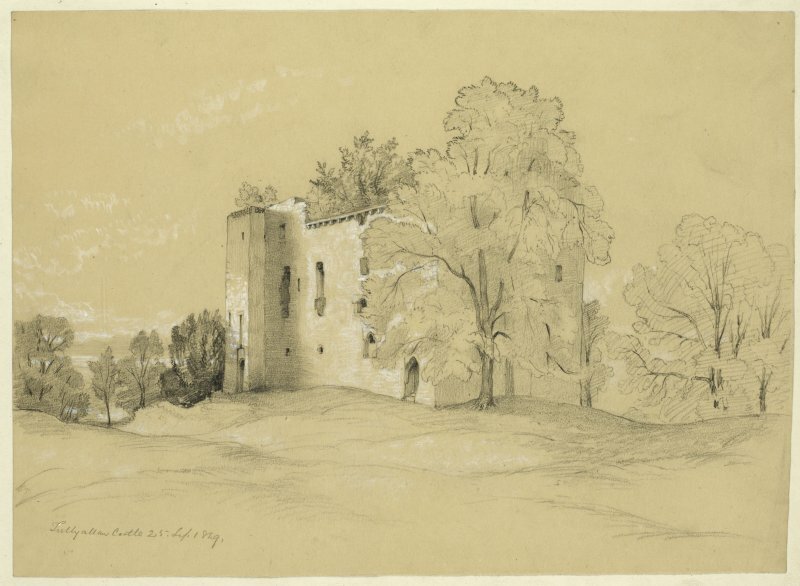 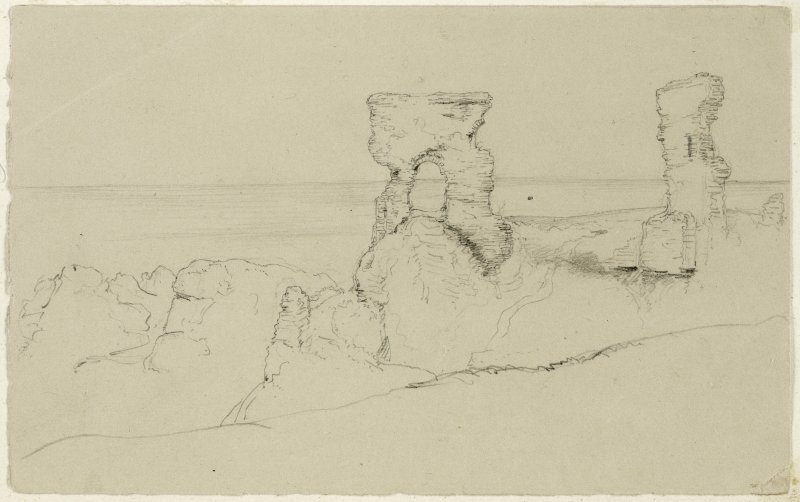 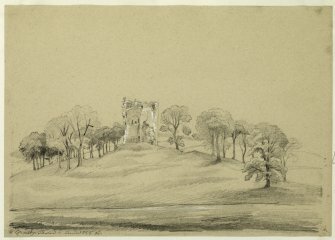 Drummond’s drawings reflect growing antiquarian interests during the 19th century and stand today as both works of artistic merit and invaluable visual records of many sites that have since been altered or destroyed. 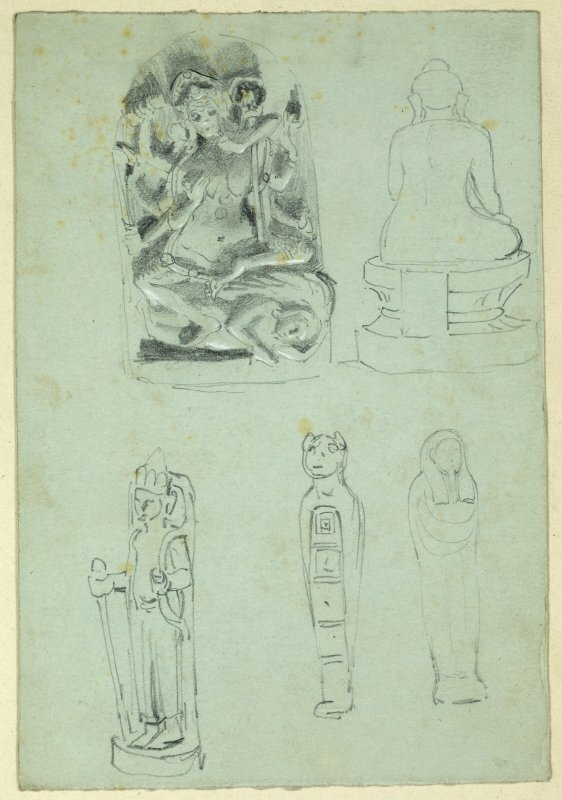 Highlights from the collection can be explored below. Drawing of Elphinstone Tower before demolition of the wing. 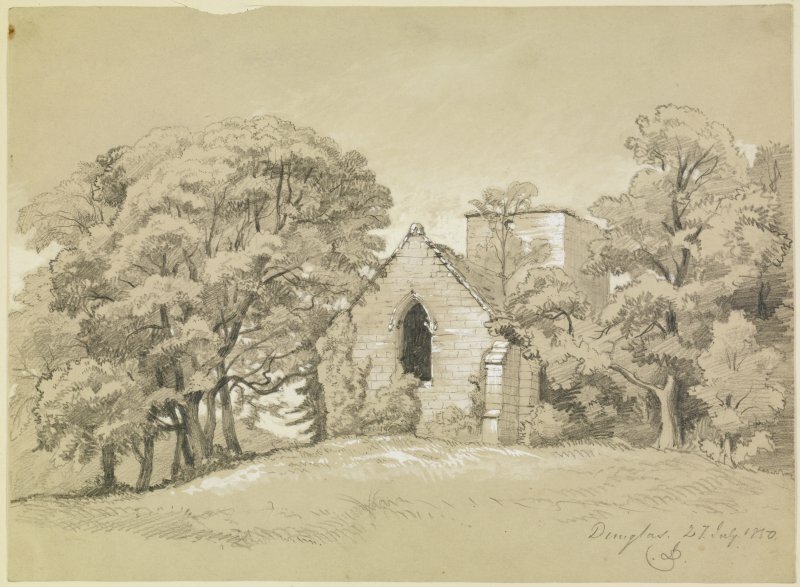 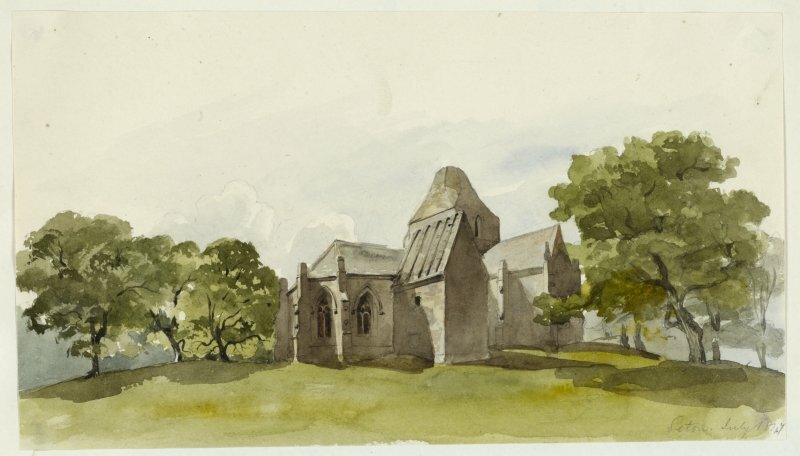 Drawing of general view of Dunglass Collegiate Church. 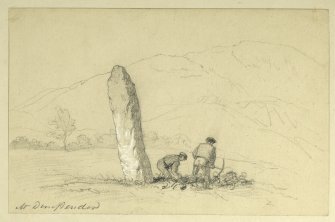 Drawing of Clach a Charra stone. 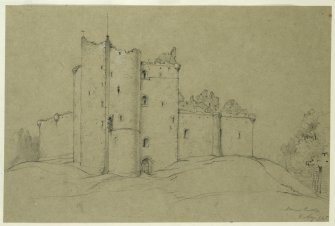 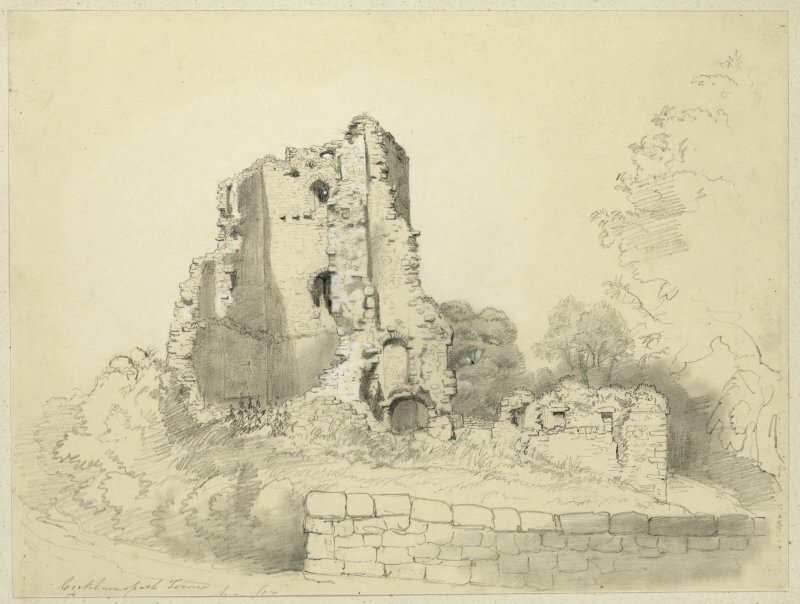 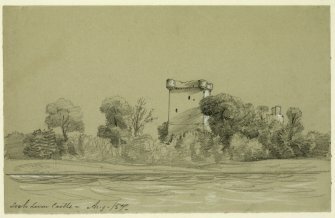 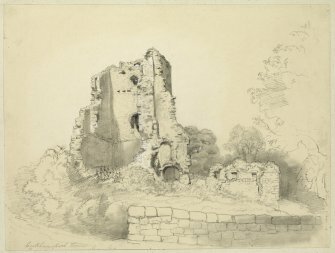 Drawing of Hallyards Castle from SE. Painting of the Memorial Stone near Craigmillar Castle. Drawing of Clackmannan Market Cross and King Robert's Stone. 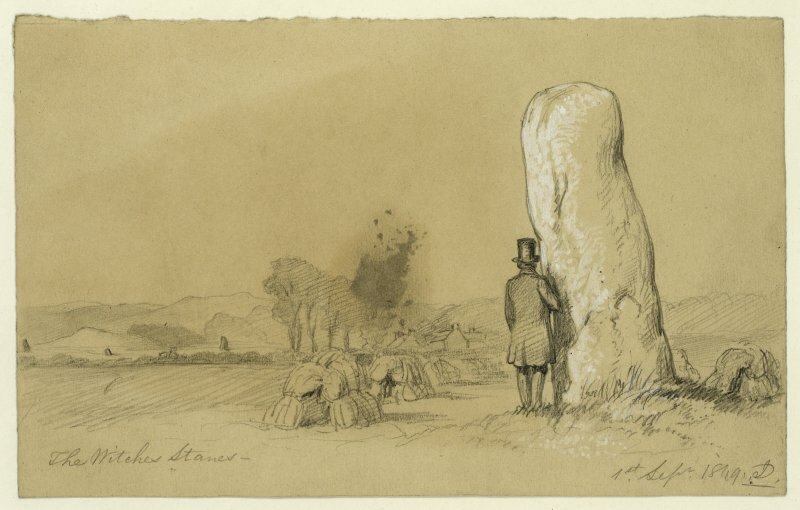 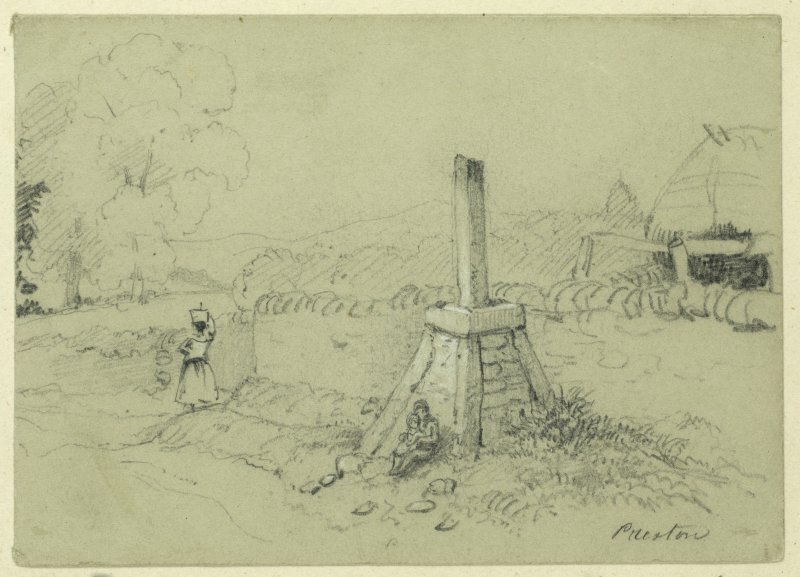 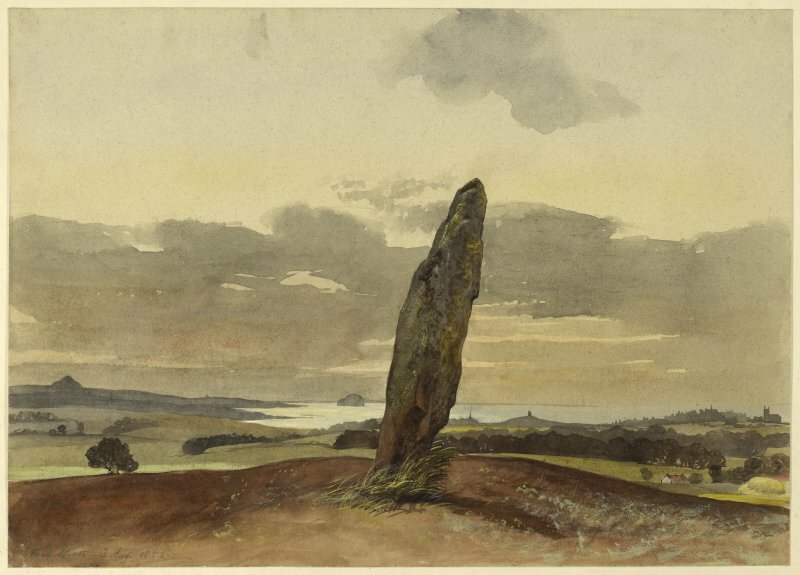 Drawing of standing stone at Easter Broomhouse near Spott. 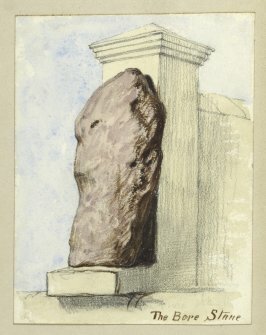 Drawing of the Caiy Stone. 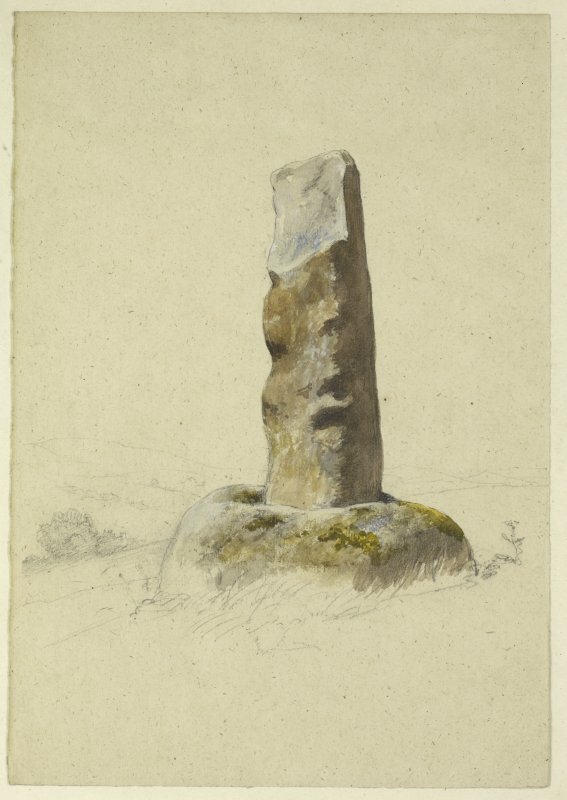 Drawing of The Buck Stane. 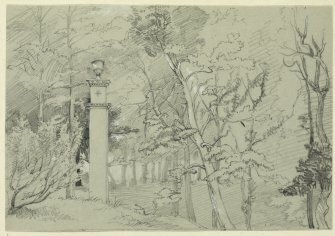 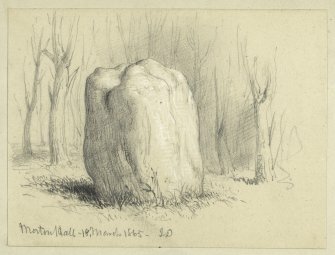 Drawing of the standing stone at Morton Hall. 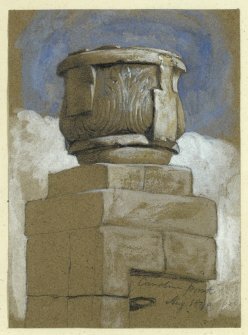 Painting of Eccles Market Cross at Crosshall. 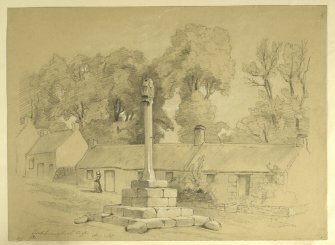 Drawing of Coldingham Market Cross. Drawing of Bowden Market Cross. 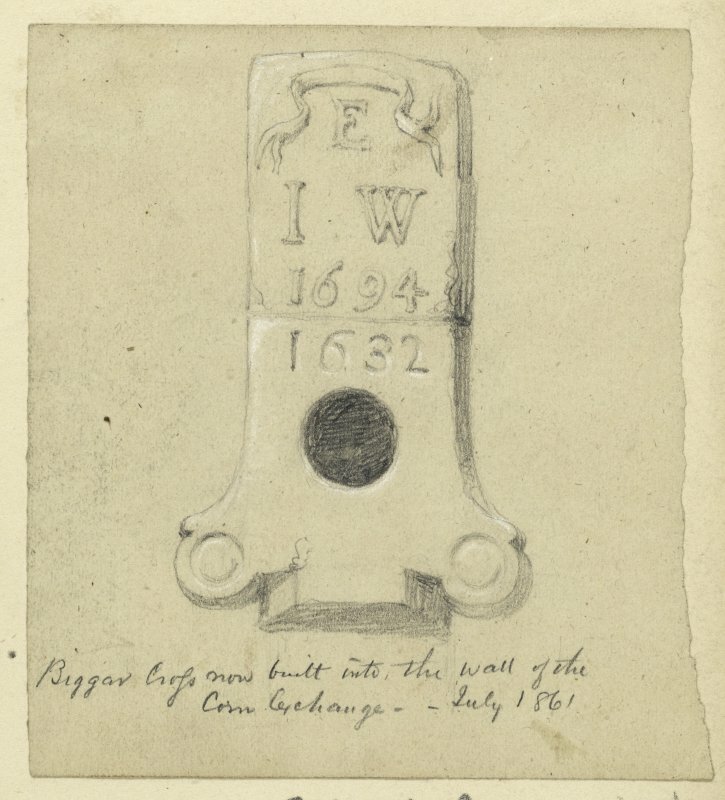 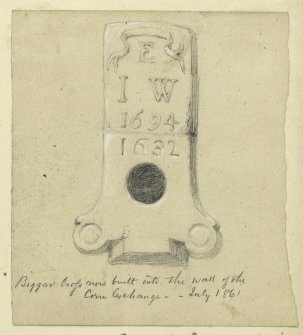 Drawing showing the remains of Biggar Cross built into the wall of the Corn Exchange. 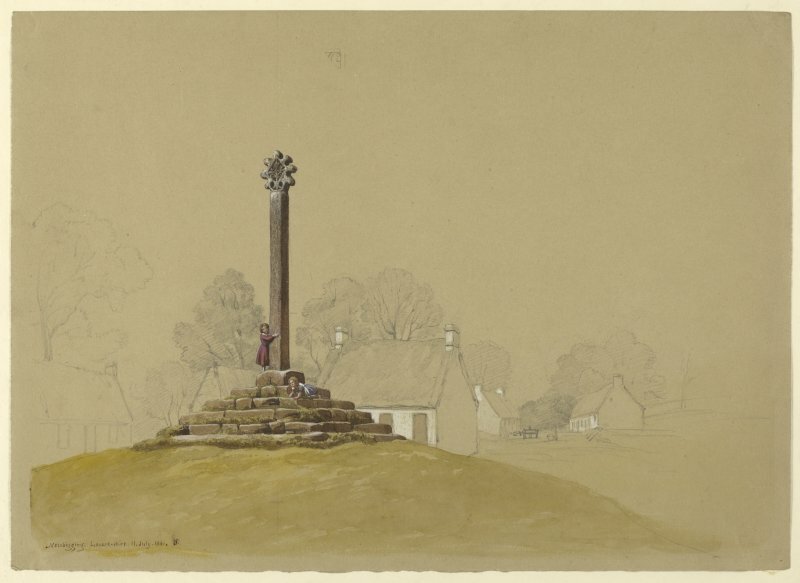 Drawing of The Headless Cross, Standing in the grounds of Airth Castle where Upper Airth was. 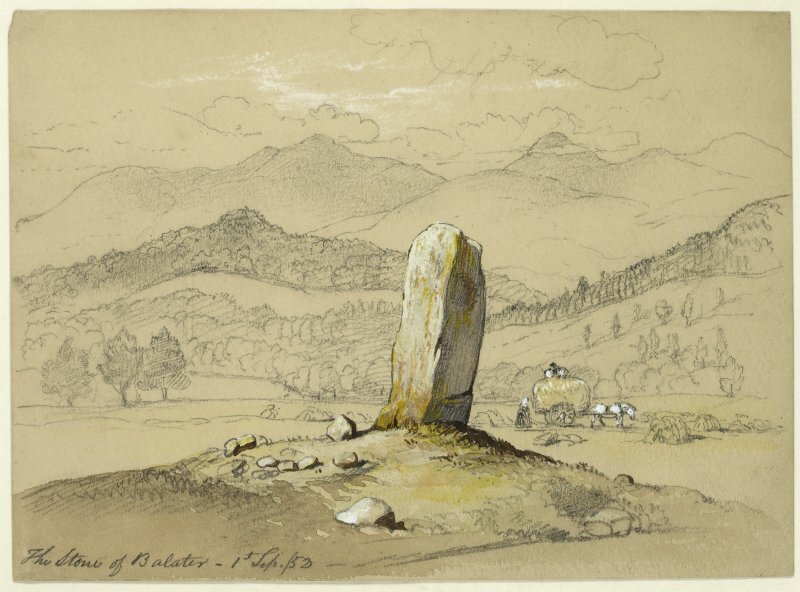 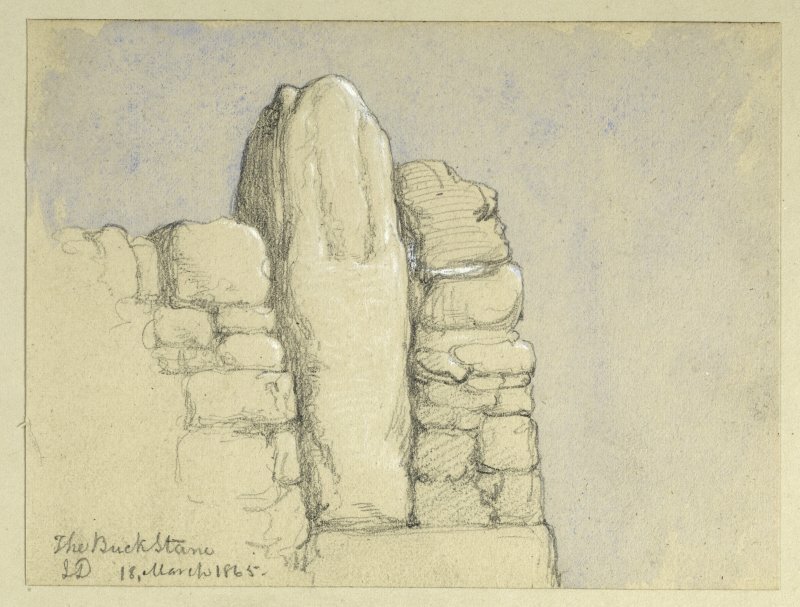 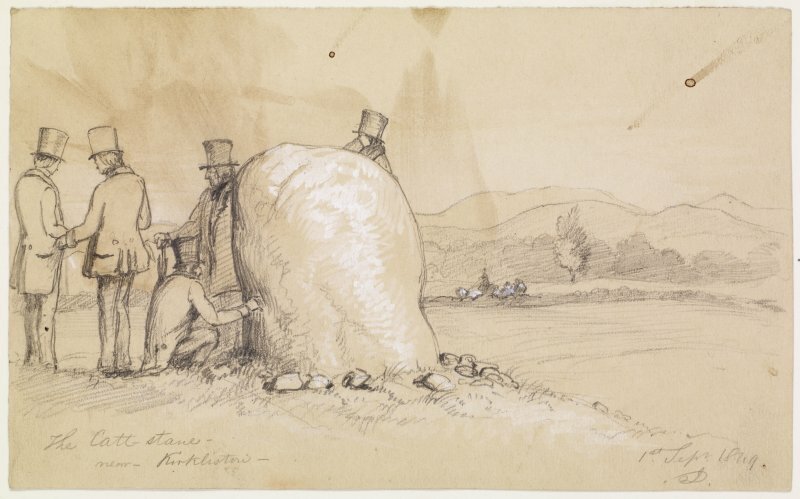 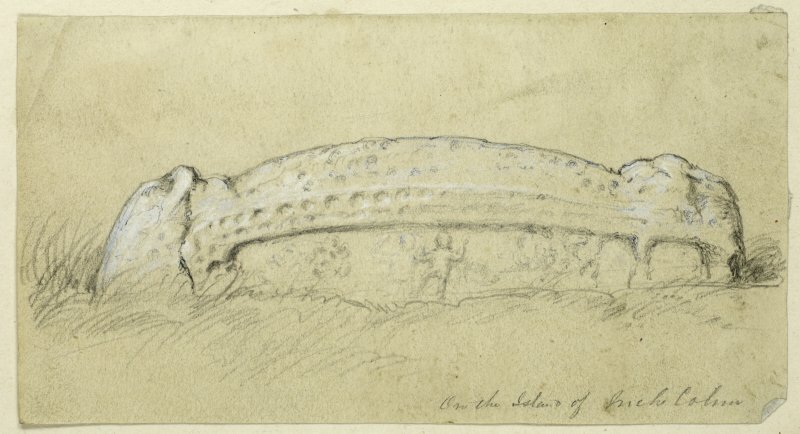 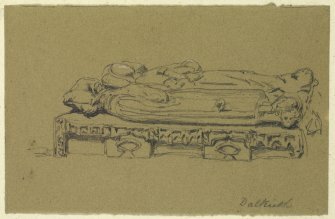 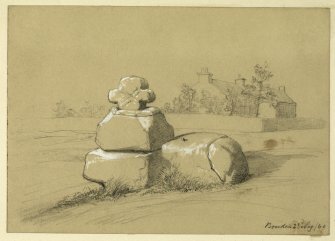 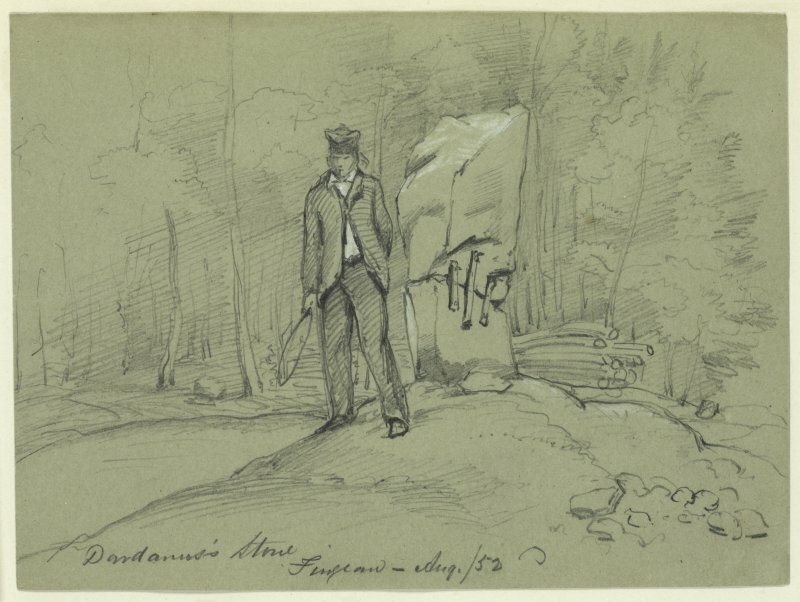 Drawing of the Stone of Ballater. 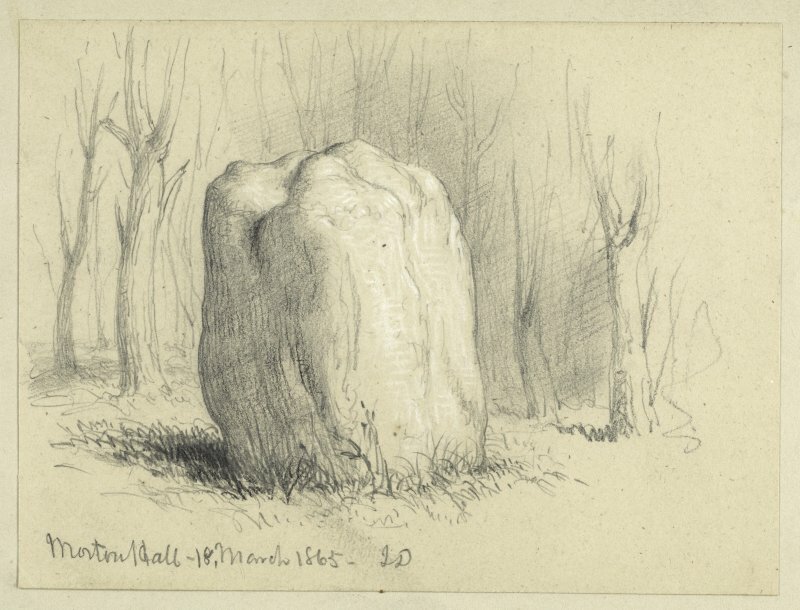 Drawing of the Witches' Stane. 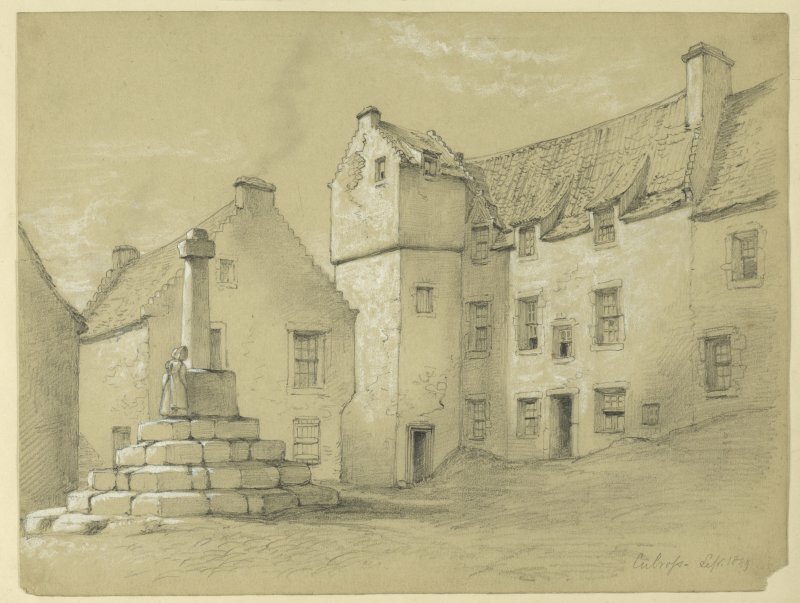 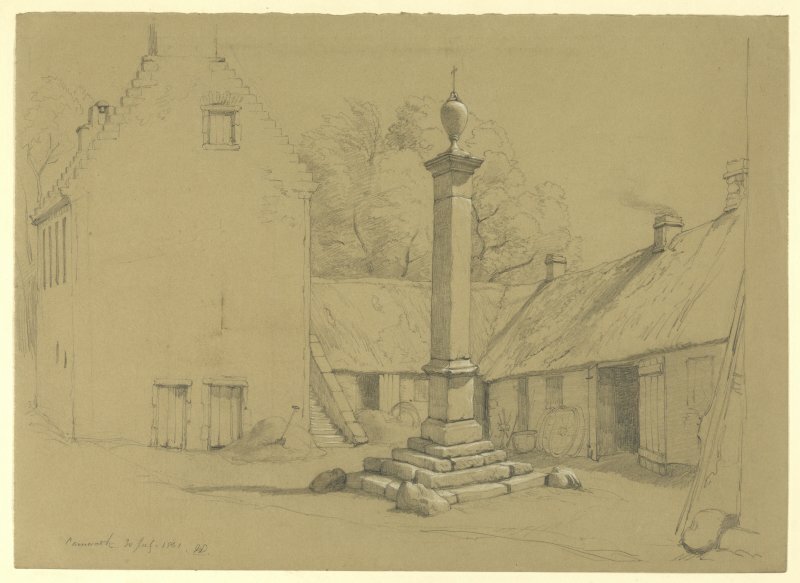 Drawing of Culross Market Cross. 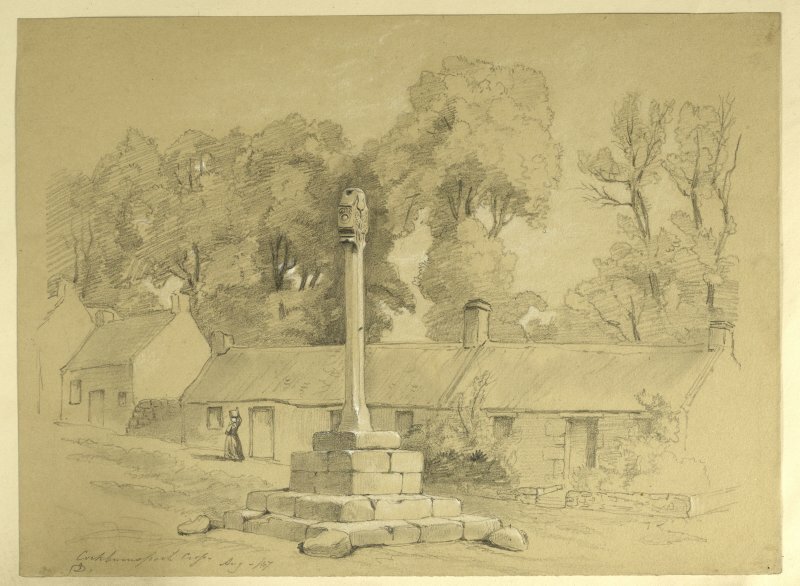 Drawing of Newbigging Market Cross. 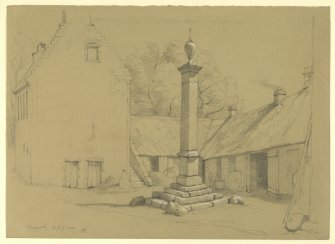 Drawing of Kincardine Market Cross. 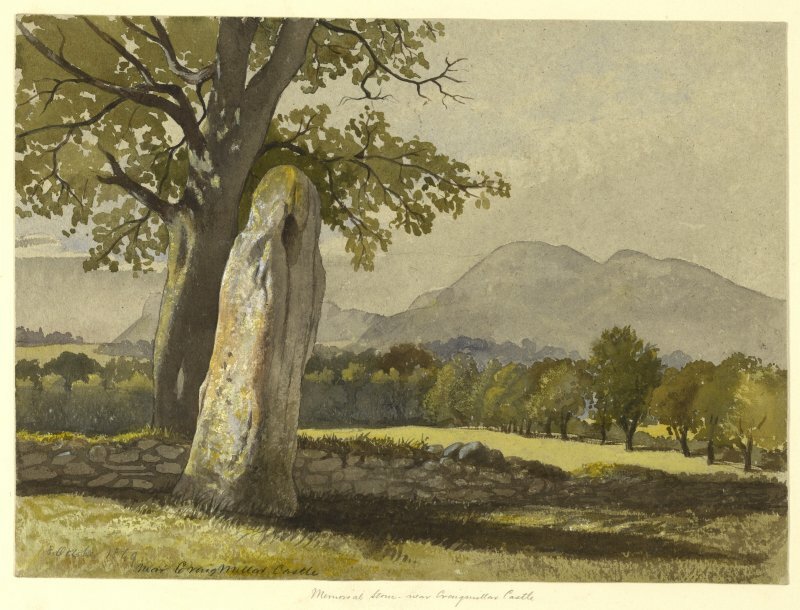 Watercolour of Clach A' Bhranguis. 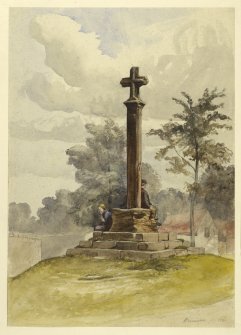 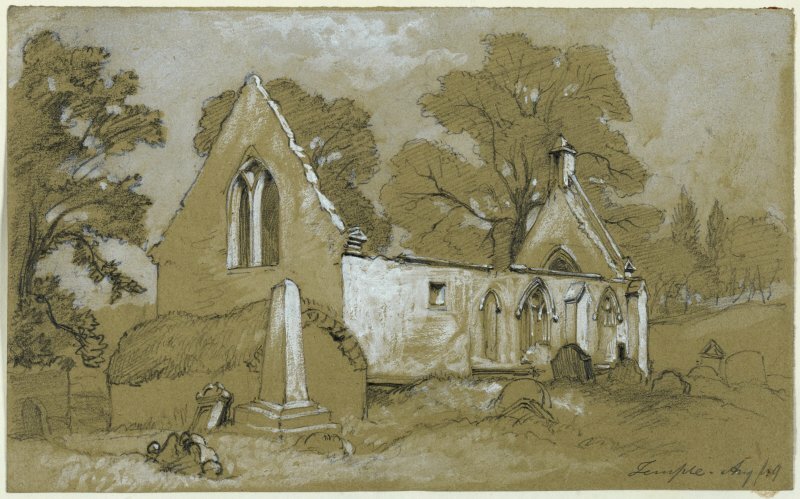 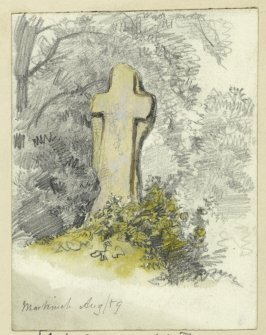 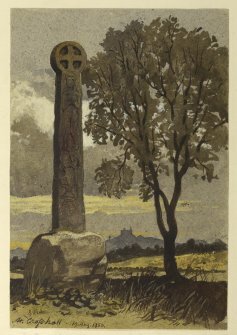 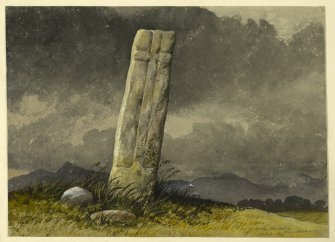 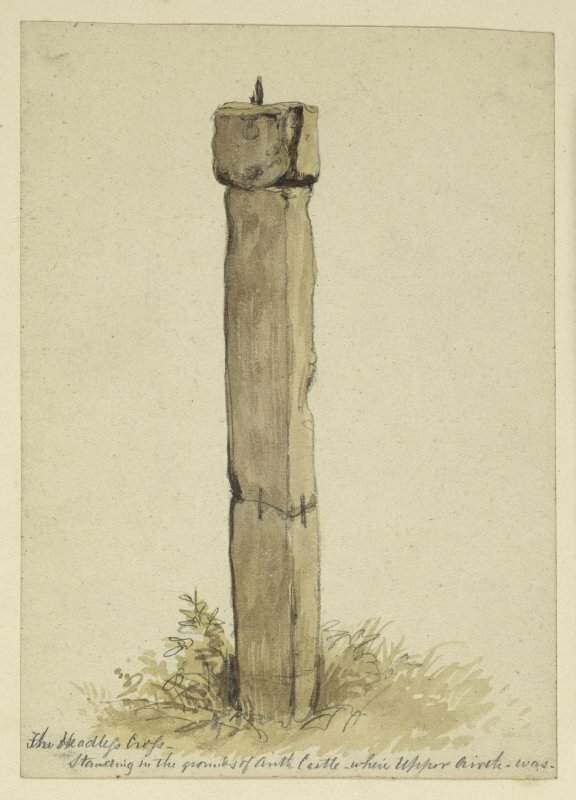 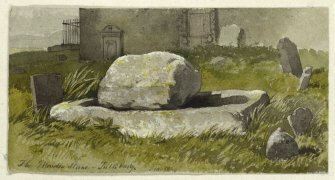 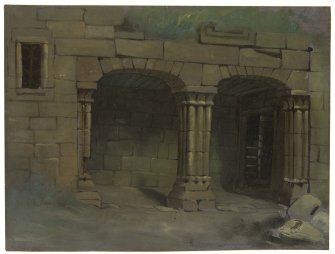 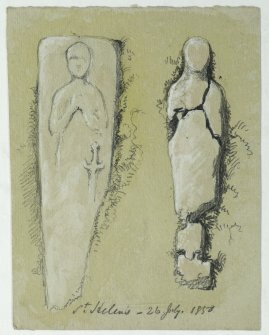 Watercolour of cross slab at Hawkhill. 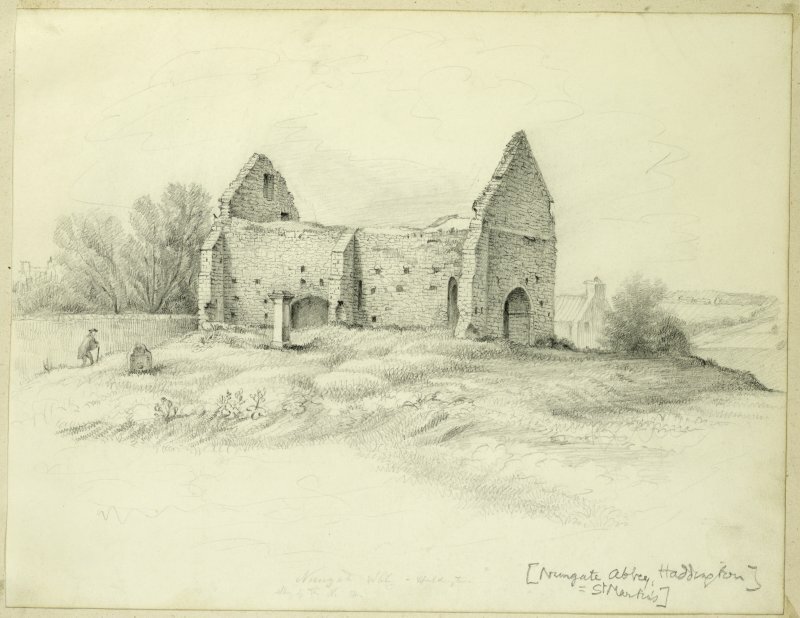 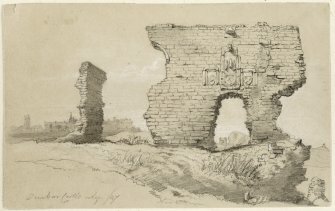 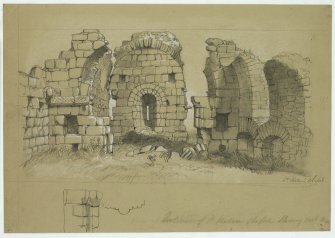 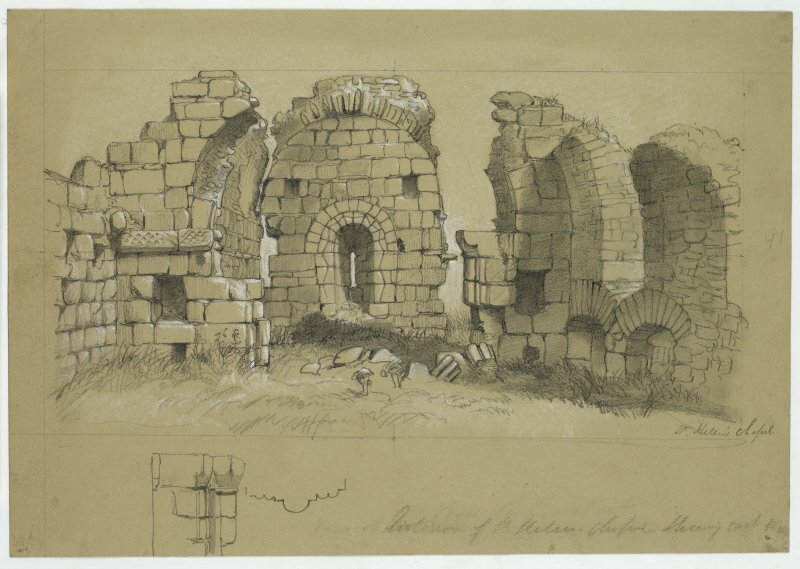 Drawing of a view of the ruins of St. Helen's Chapel. 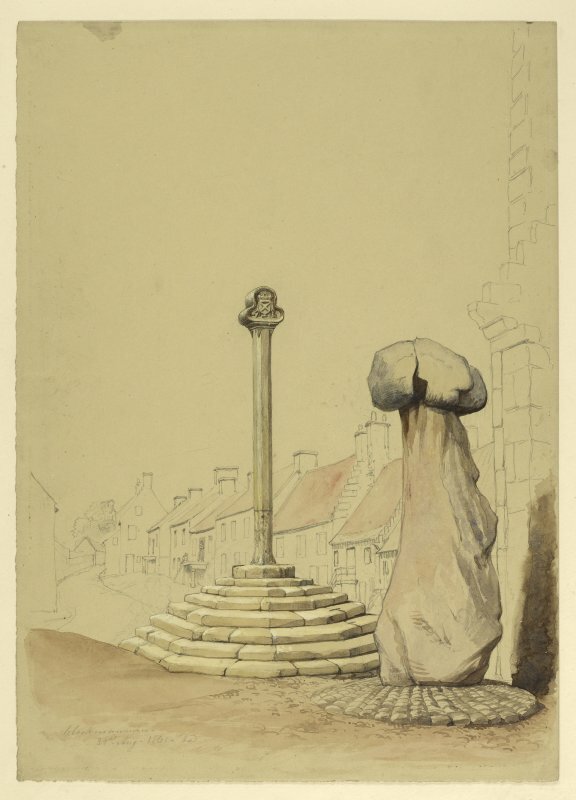 Watercolour of Prestonpans Market Cross. 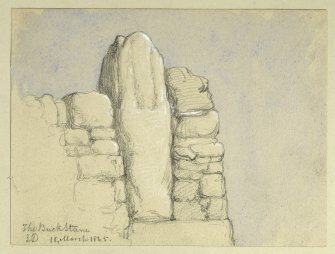 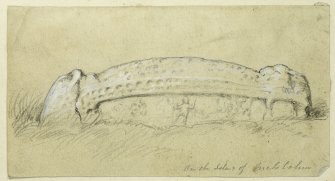 Drawing of the Loth Stone. 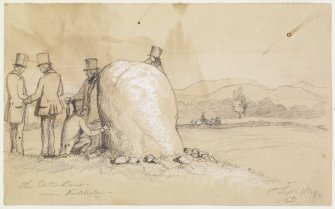 Drawing of the Loth Stone with people digging. Drawing of Inverkeithing Market Cross. Drawing of Dardanus' Stone (Corsedardar). 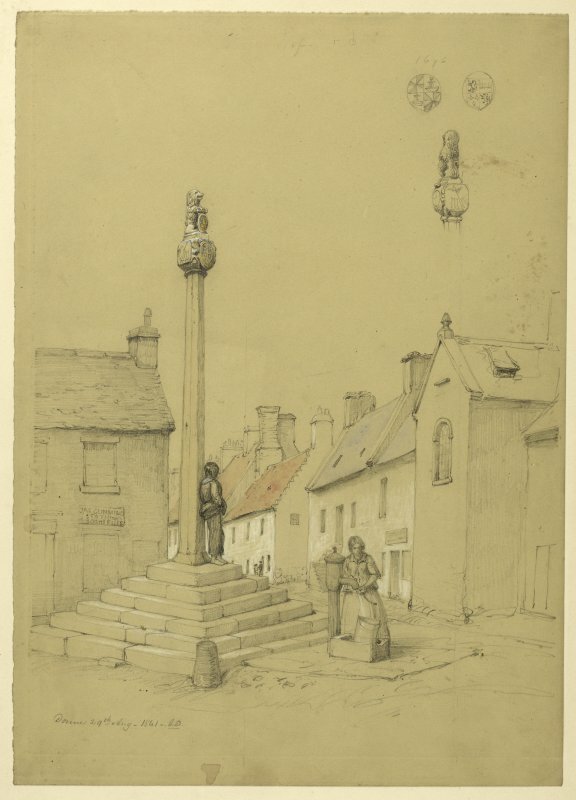 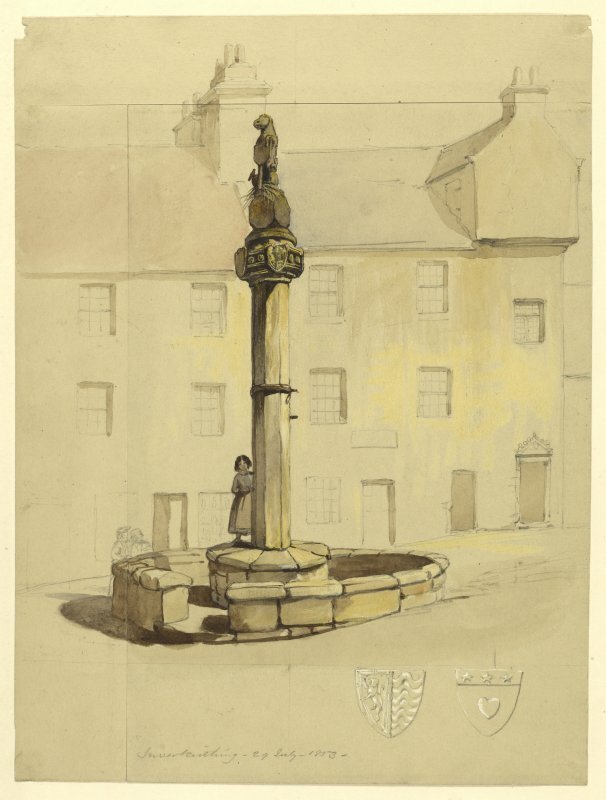 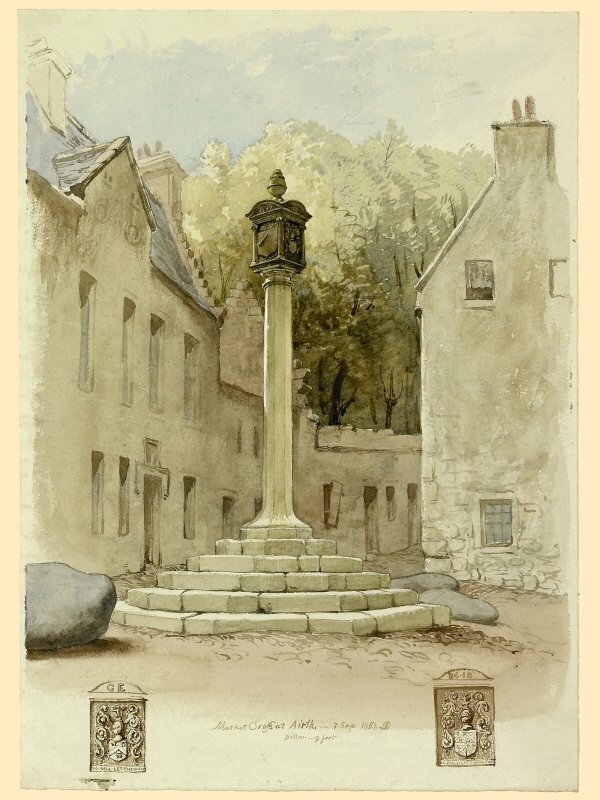 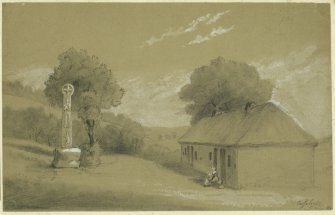 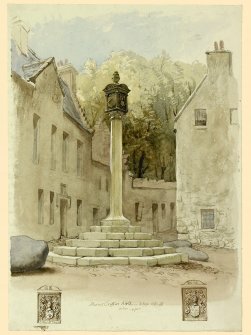 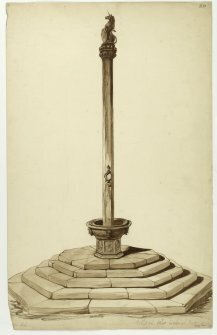 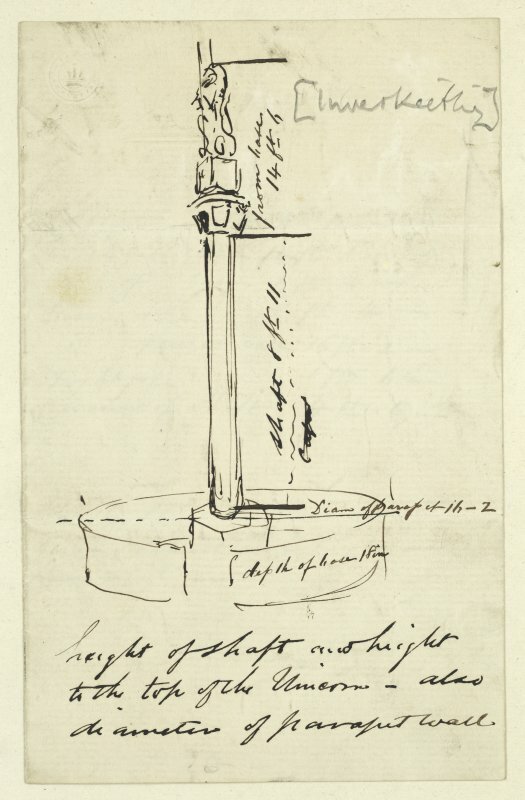 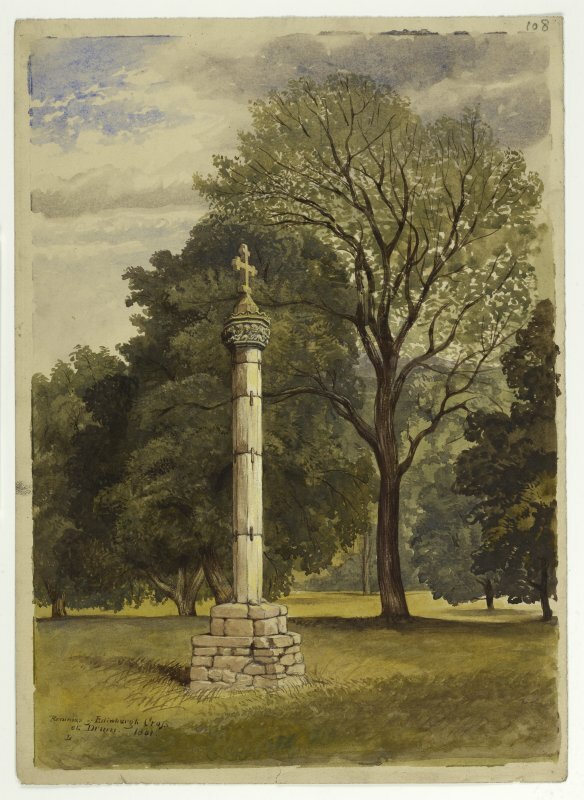 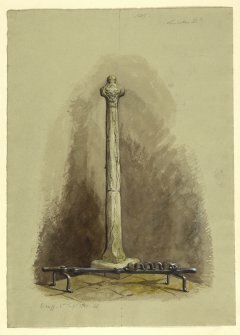 Drawing of Pencaitland Market Cross. 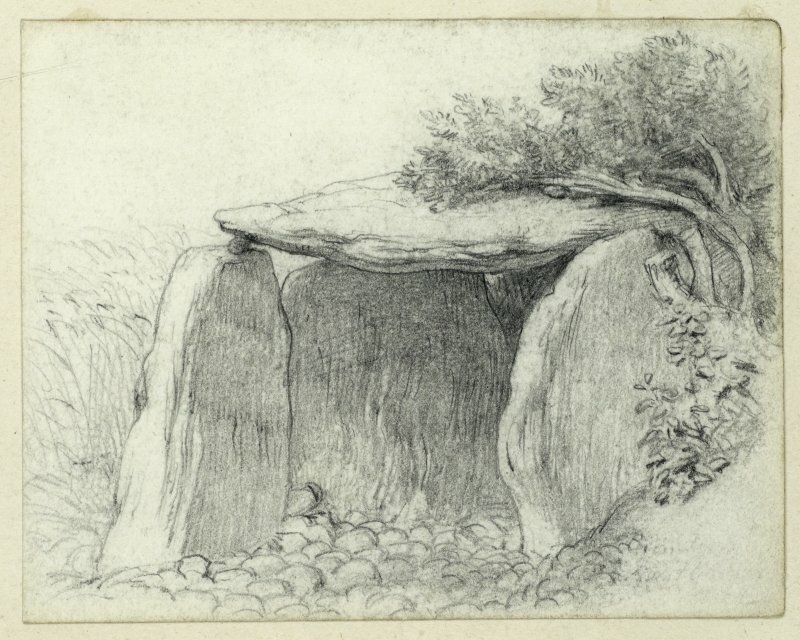 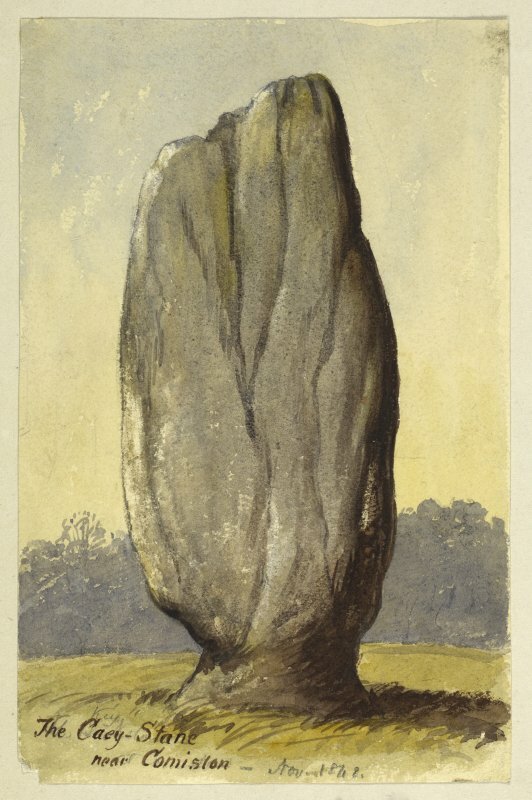 Drawing of Todholes Standing Stone. 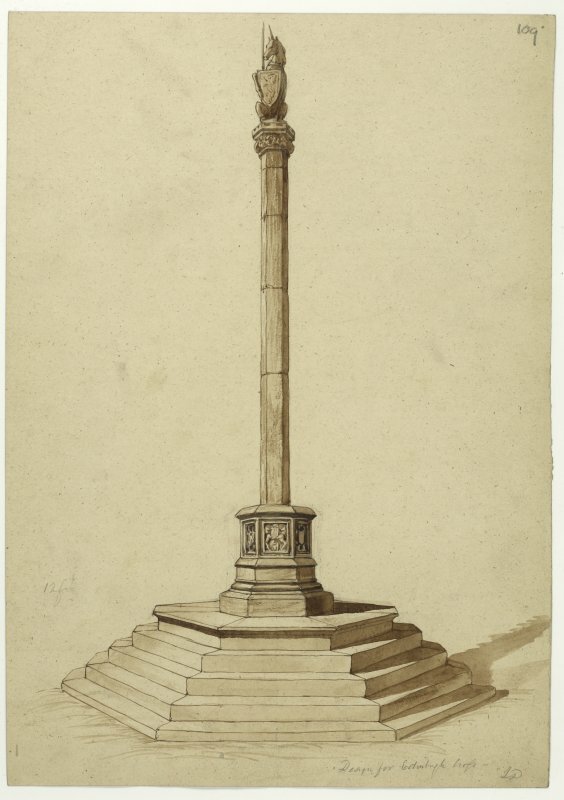 Drawing of Eccles Market Cross at Crosshall. 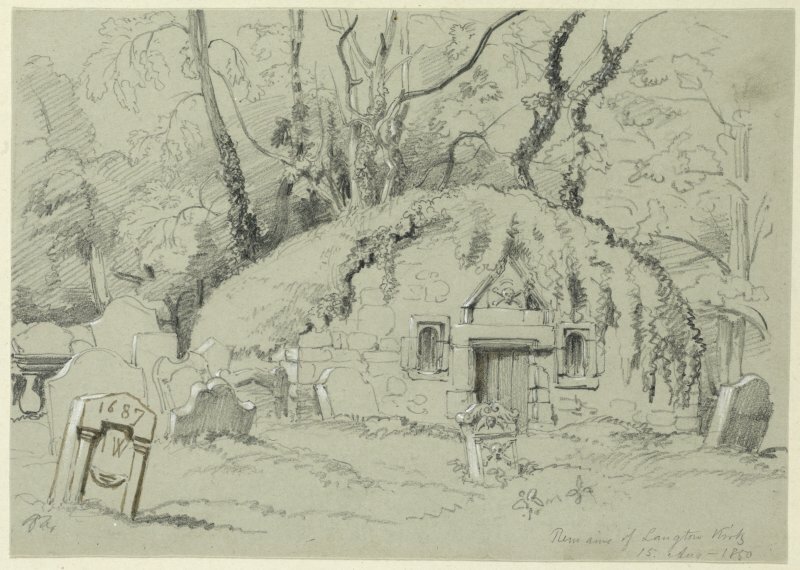 Drawing of general view of burial vault at Langton Church. 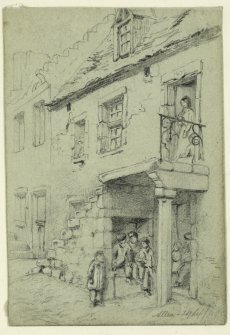 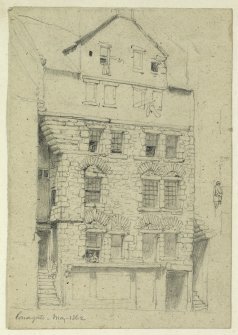 Drawing of town house in Alloa. 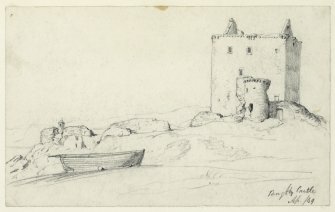 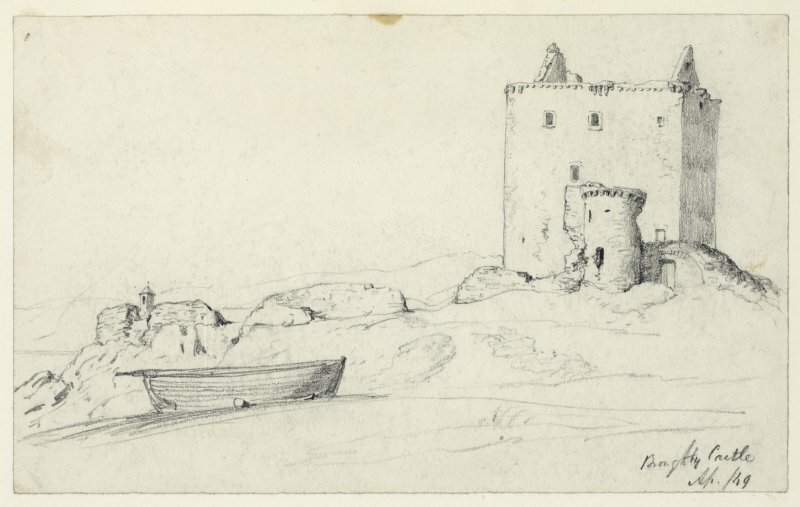 Drawing of distant view of Smailholm Tower. 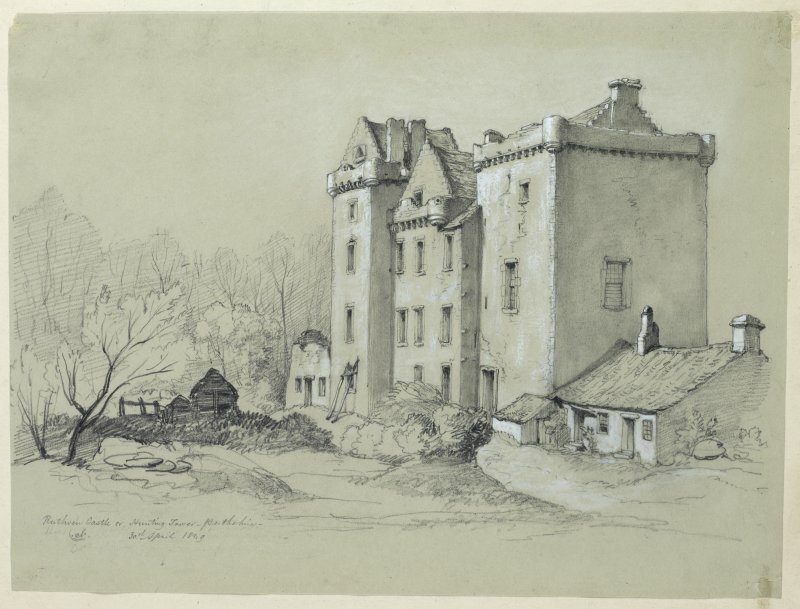 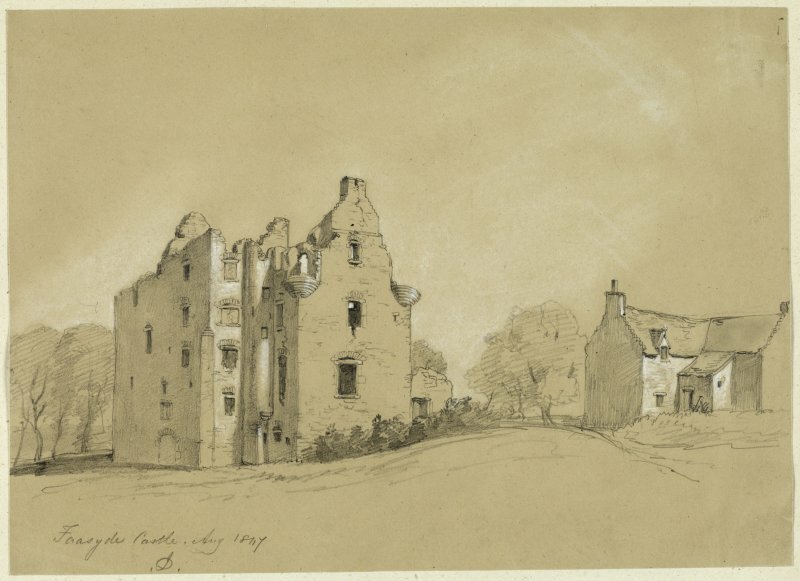 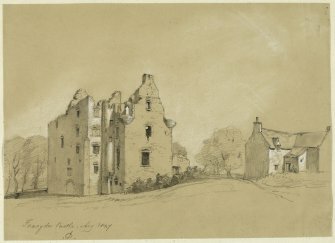 Drawing of Blairlogie Castle from the south. 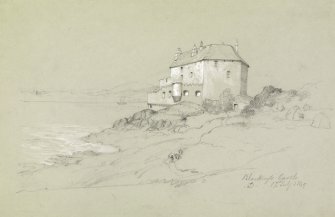 Drawing of cottage interior at Loch Sunart. 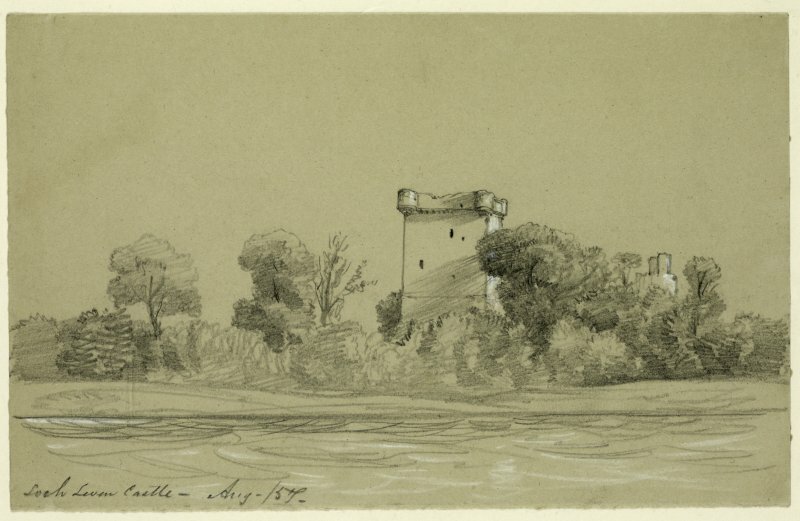 Drawing of Loch Leven Castle. 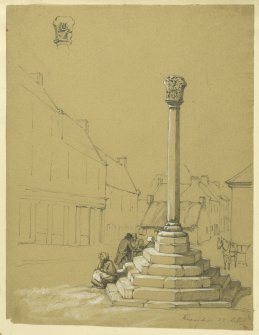 Drawing of Preston Market Cross. 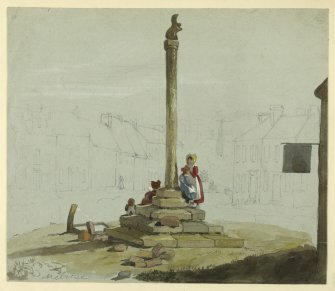 Drawing of Inverkeithing Market Cross with notes and dimensions. 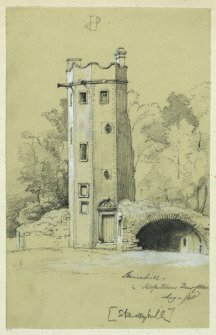 Drawing of Cockburnspath Tower Bridge. 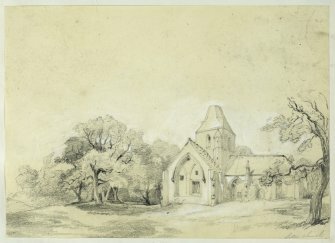 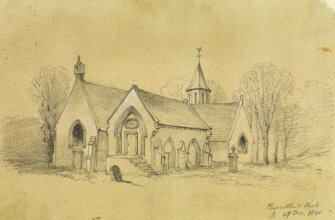 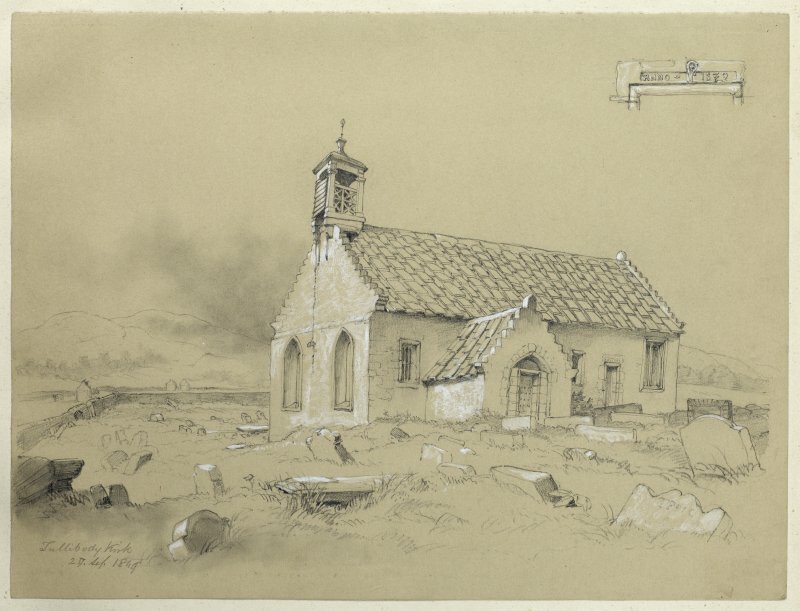 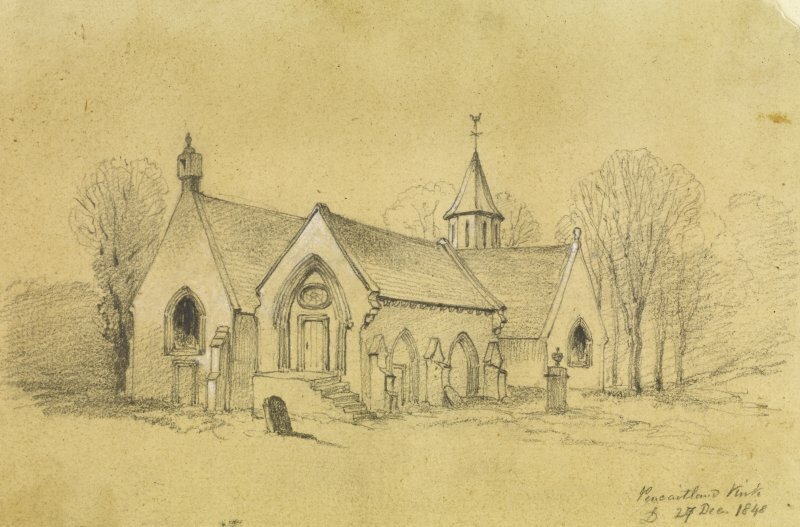 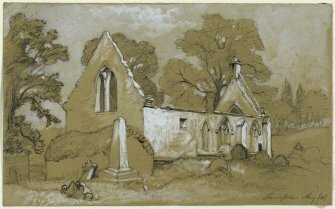 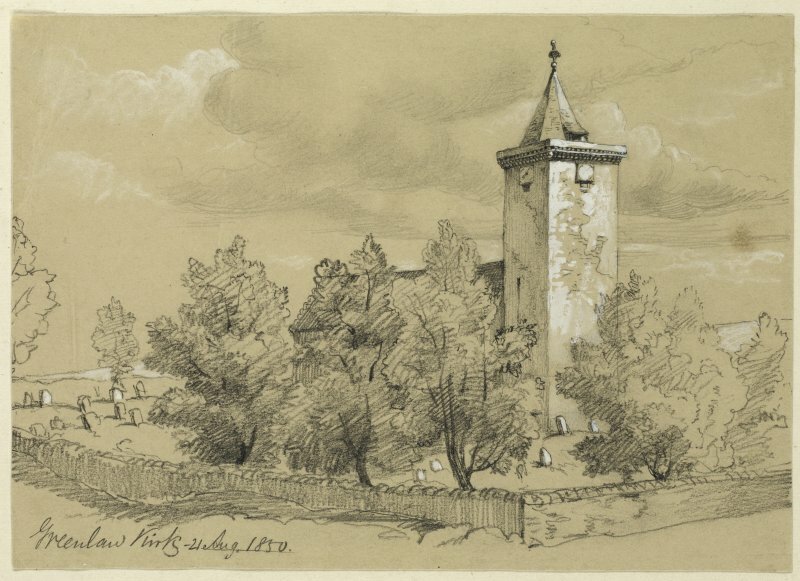 Drawing of St. Helen's Chapel. 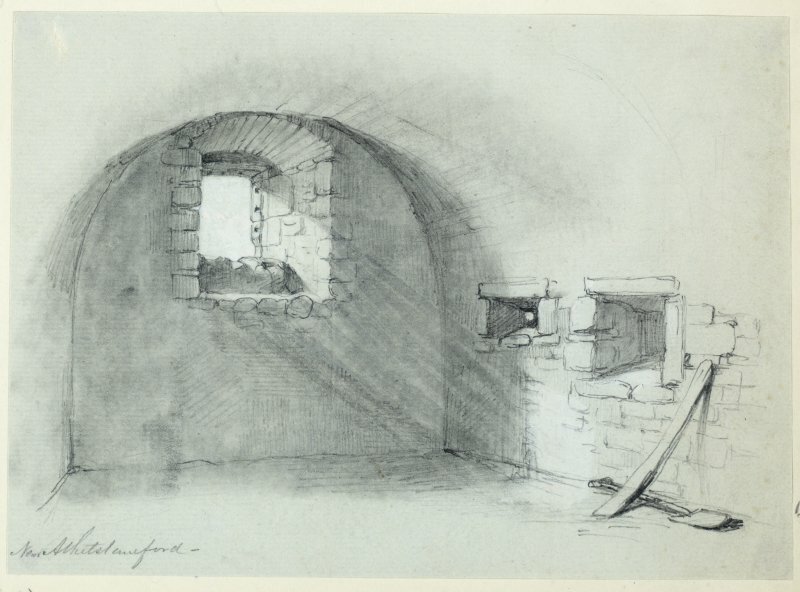 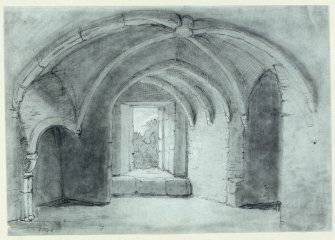 Drawing of interior of Dirleton Castle. 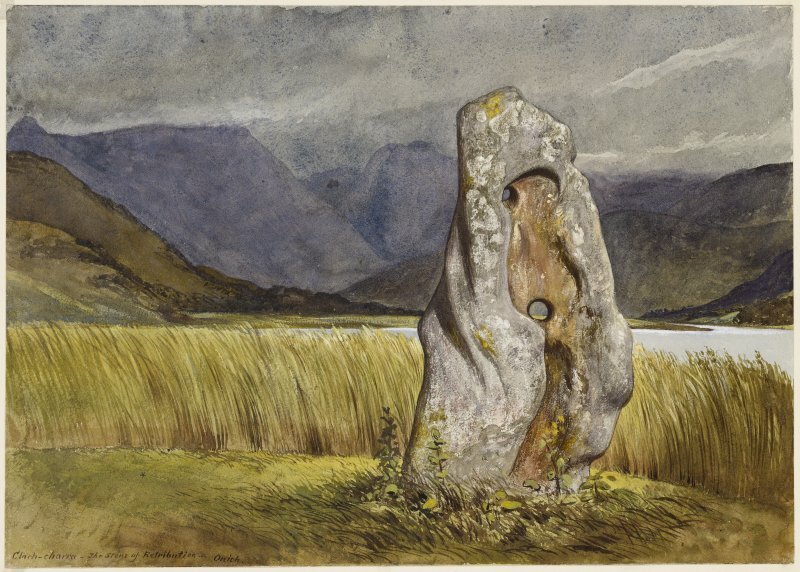 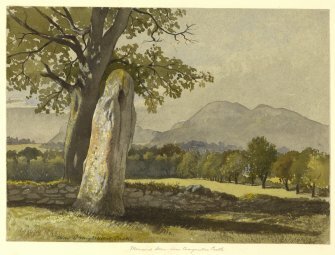 Watercolour of the Maiden Stone, Tullibody. 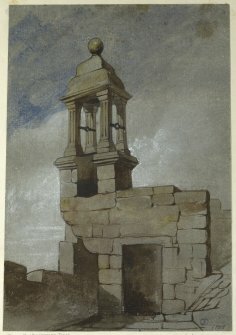 Drawing of belfry at Clackmannan Tower. 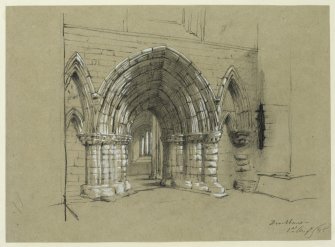 Drawing of the West entrance of Dunblane Cathedral. Drawing of Manor Castle with detail of heraldic stone. 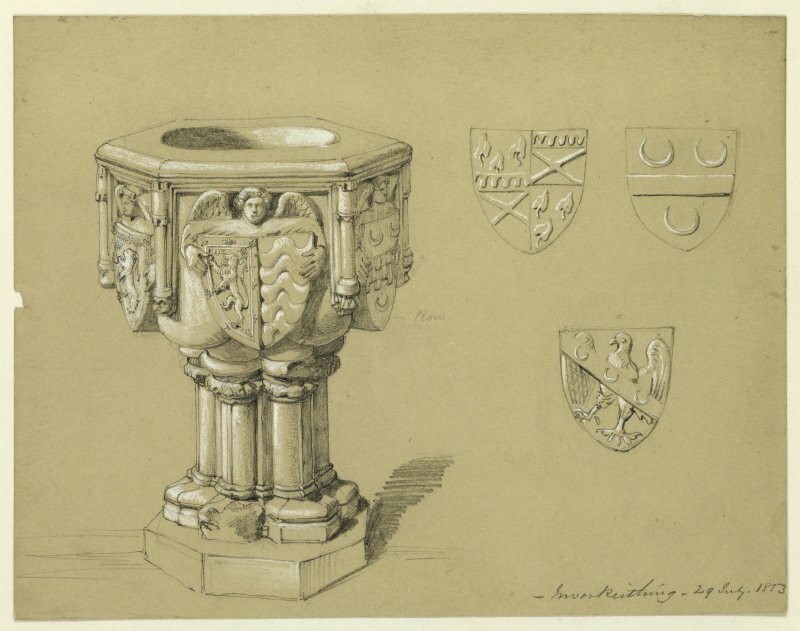 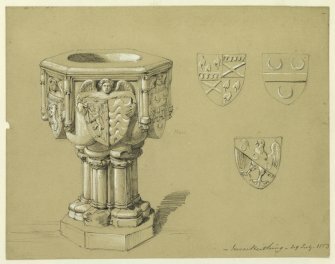 Drawing of the font at St. Peter's Church. Drawing of loggia at Castle Campbell. 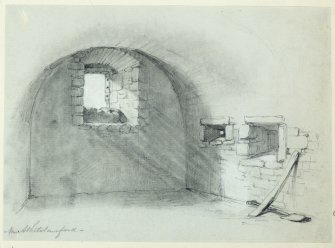 Drawing of interior at Athelstaneford. 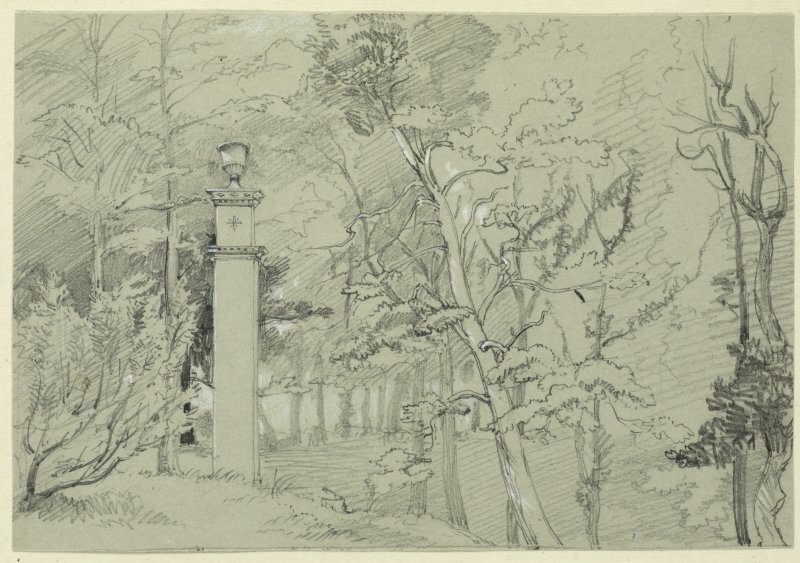 Drawing of sculptured urn on gatepost at Caroline Park. 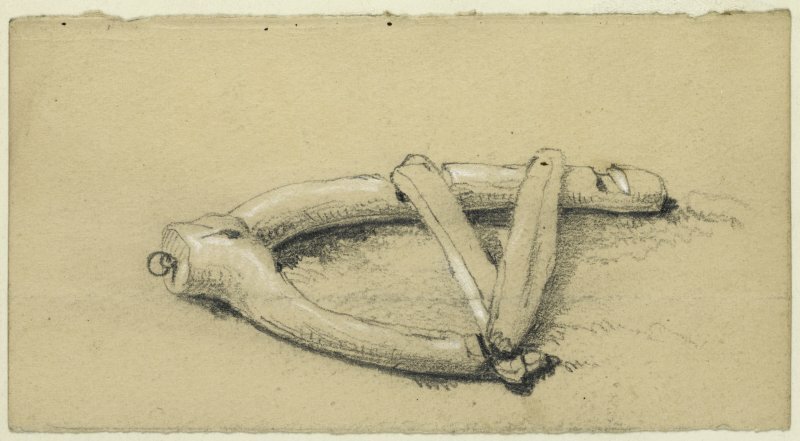 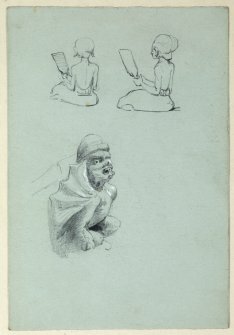 Drawing of an unidentified scene and figure. 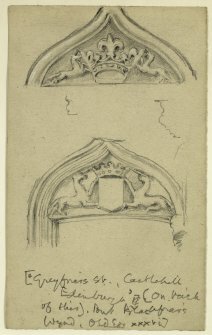 Drawing of carved armorials in the Great Hall at Elphinstone Tower. 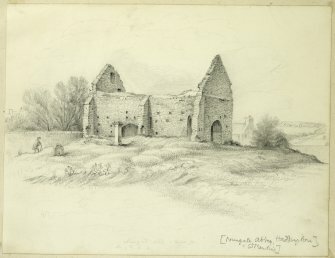 Drawing of Nungate Abbey (St. Martin's). 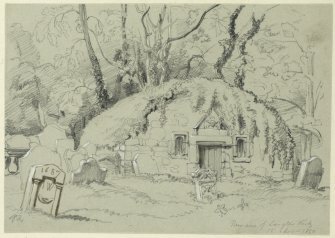 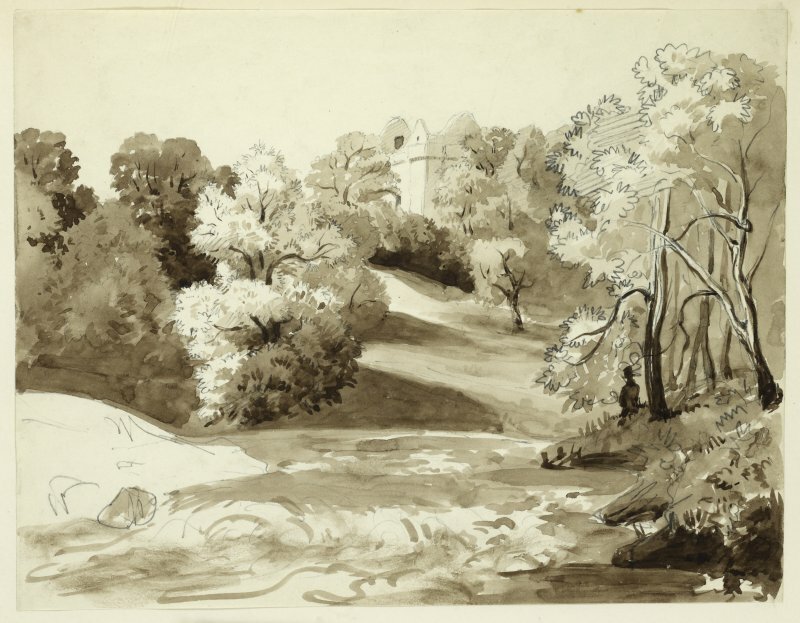 Drawing of St Anthony's Chapel in its surroundings. 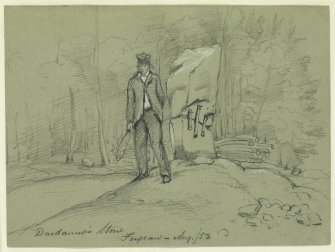 Drawing of an unidentified scene. 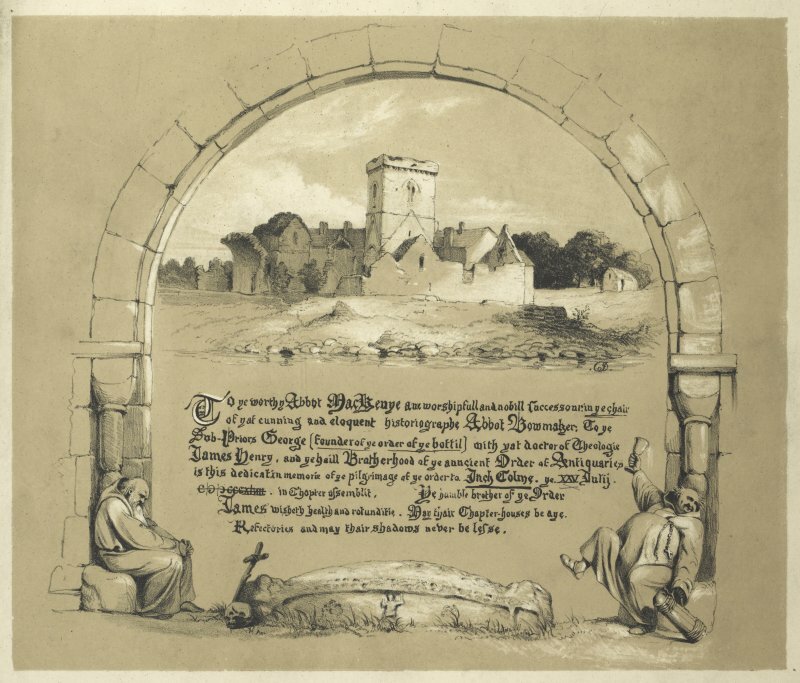 Drawing of hogback tombstone on Inchcolm Island. 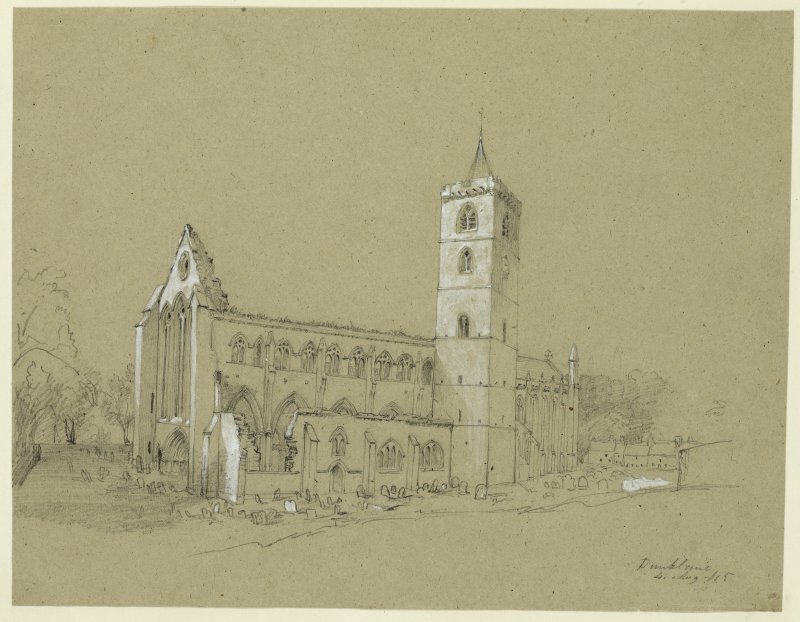 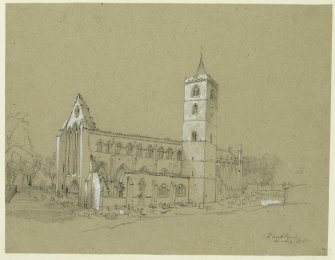 Drawing of Dunblane Cathedral from the SW. Drawing of Haco's Tomb, Haylie. 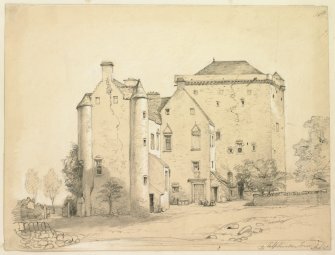 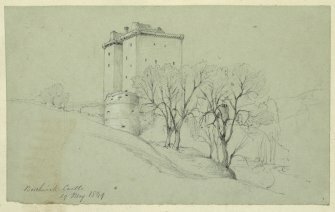 Drawing of Mar's Castle, Gallowgate. 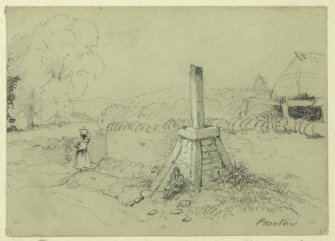 Drawing of unidentified monument in woodland. 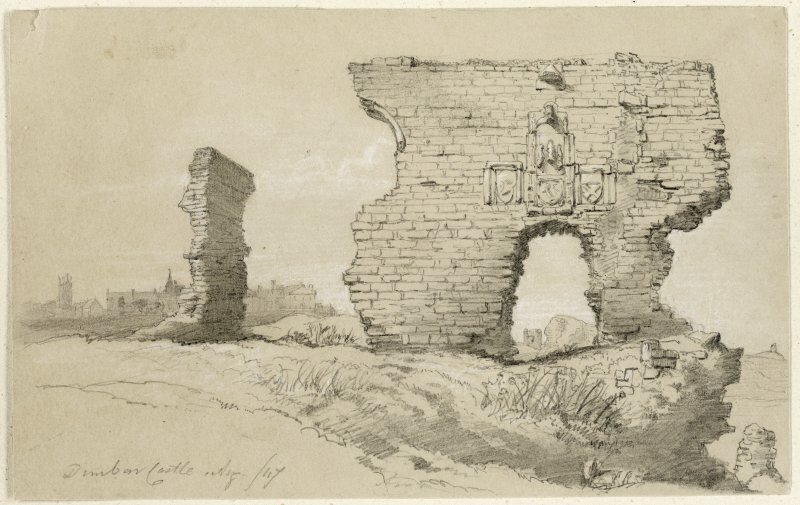 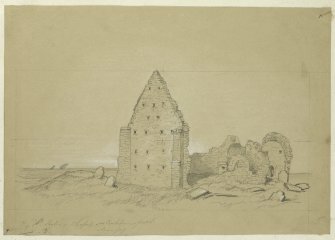 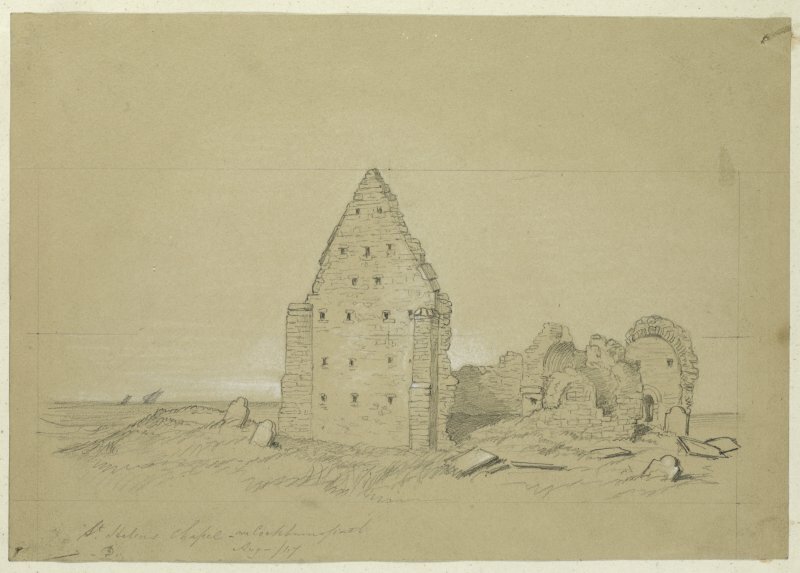 Drawing of the remains of St. Abb's Chapel with Fast Castle in the distance. 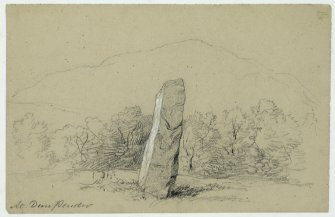 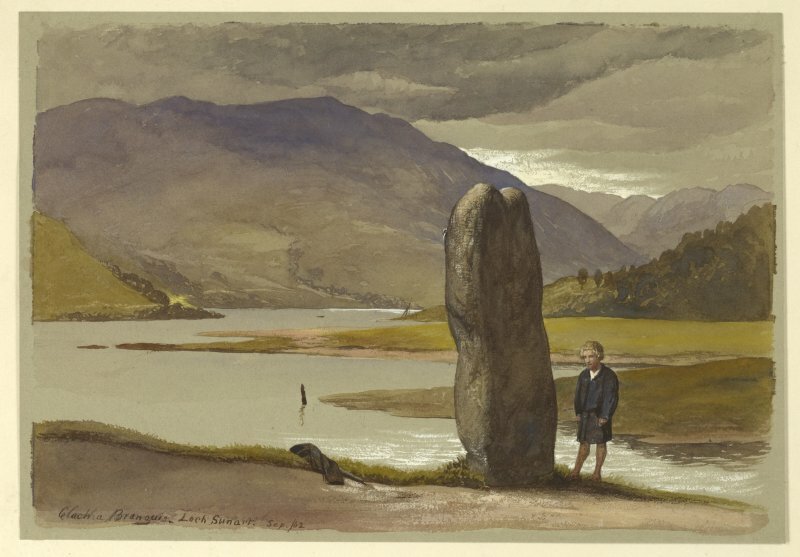 Drawing of standing stone at Benderloch. 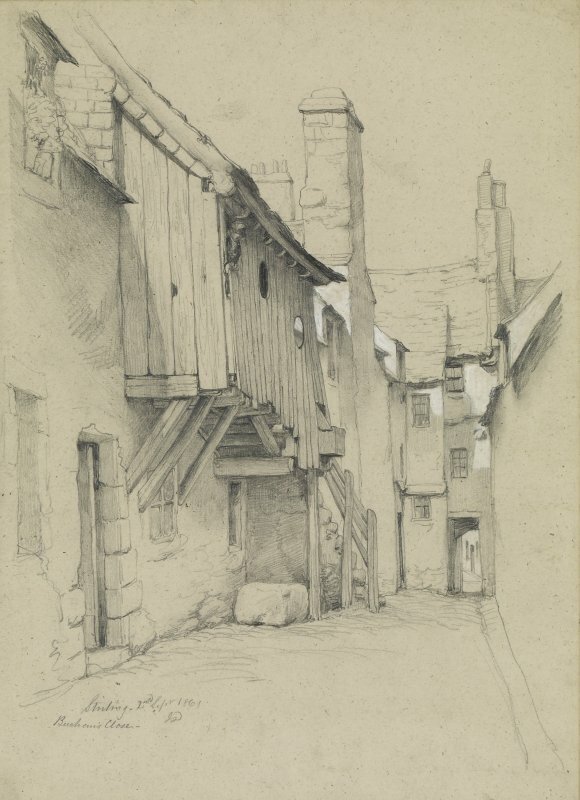 Drawing of Sheephead Wynd, Leith. 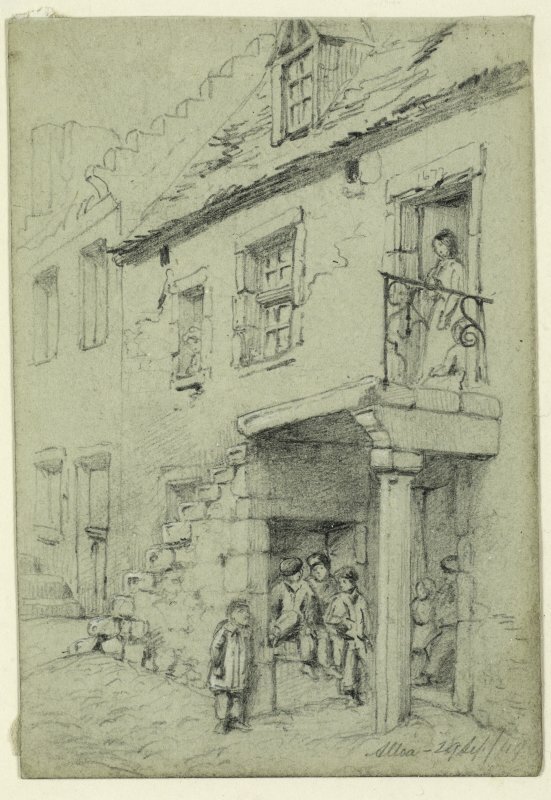 Insc: '1848 Sheephead Wynd, Leith'. 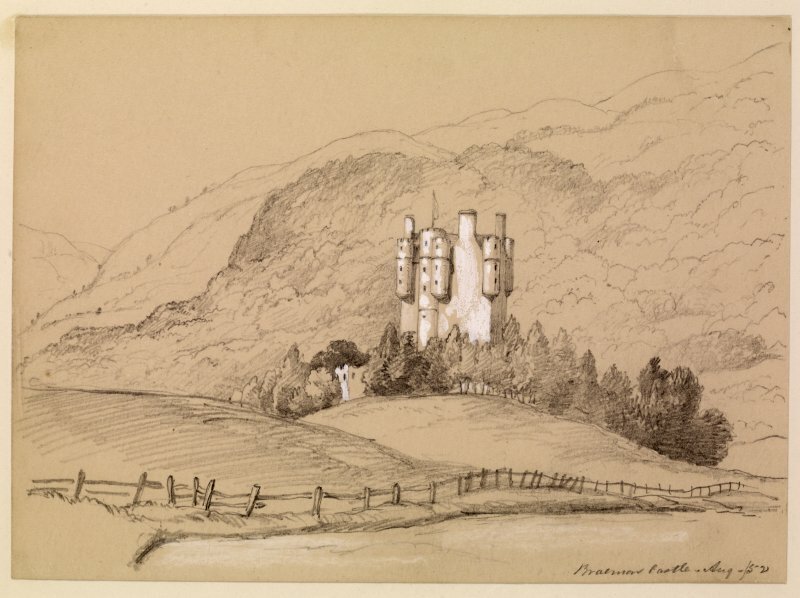 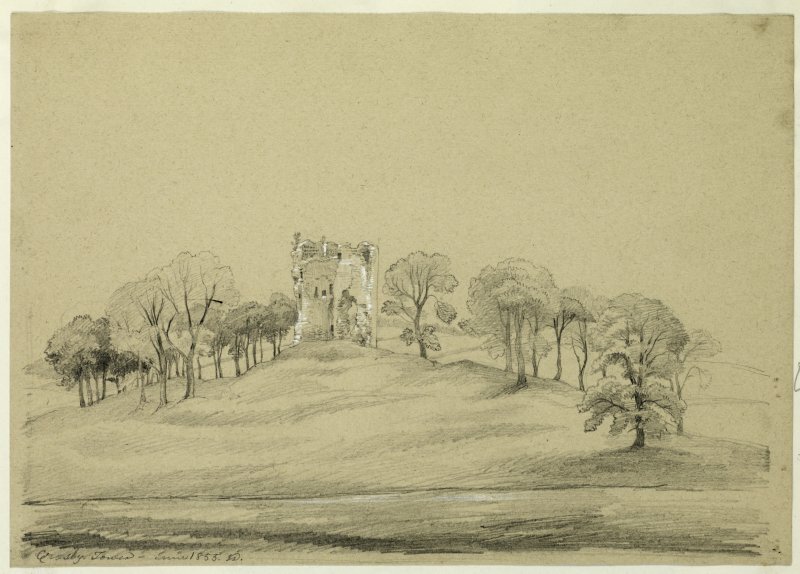 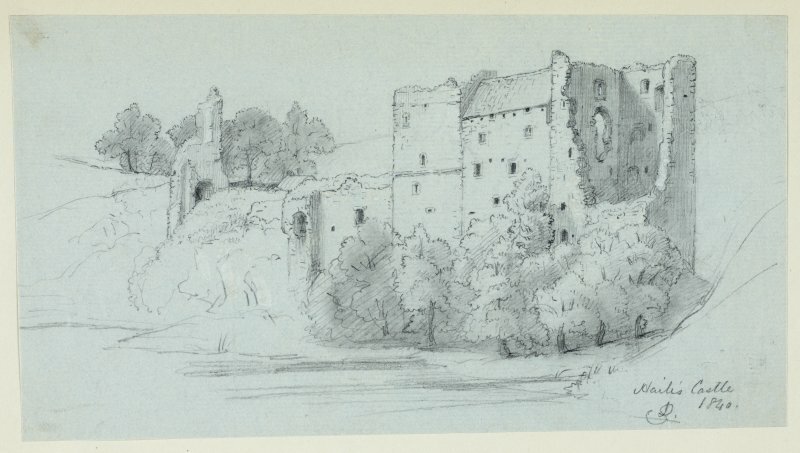 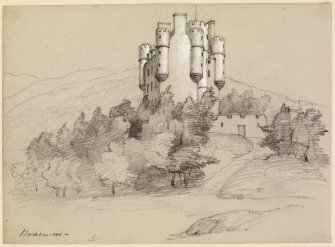 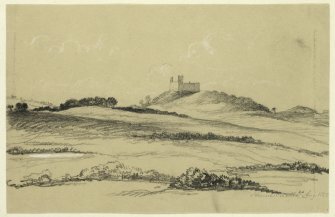 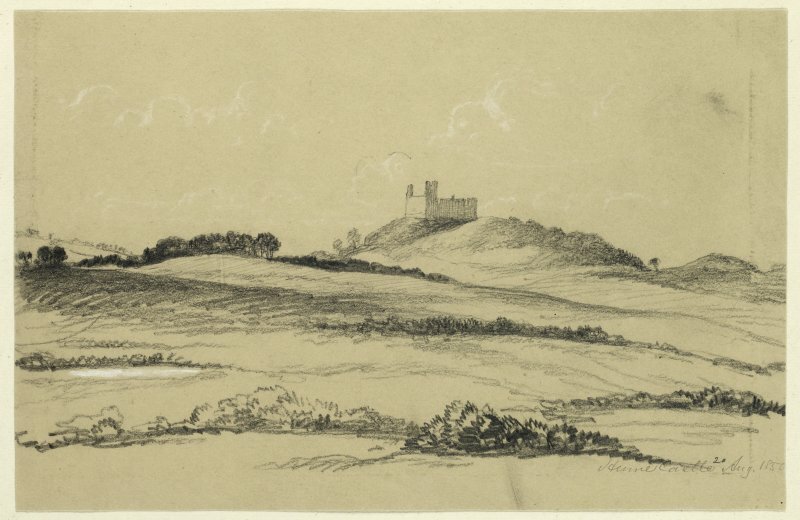 Drawing of Ruthven Castle from North. 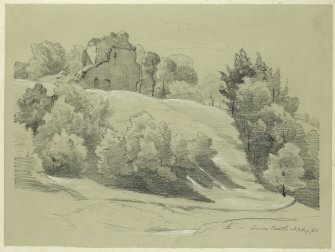 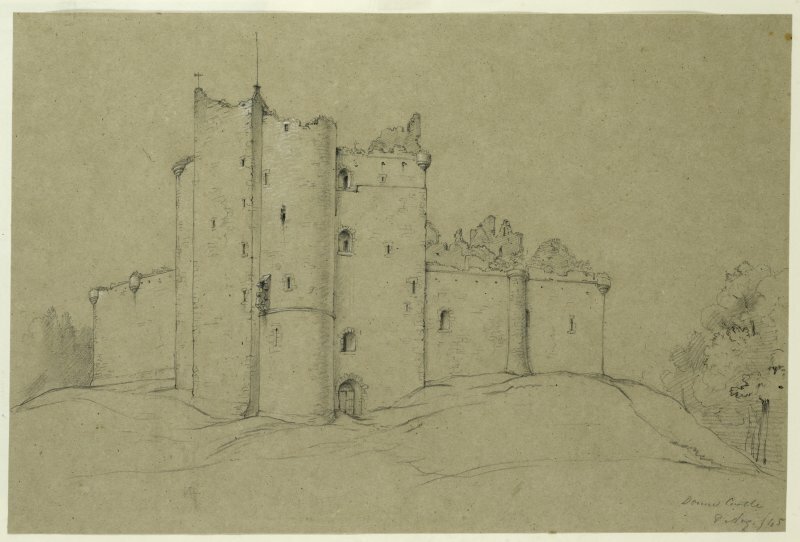 Drawing of Ruthven Castle from the South. 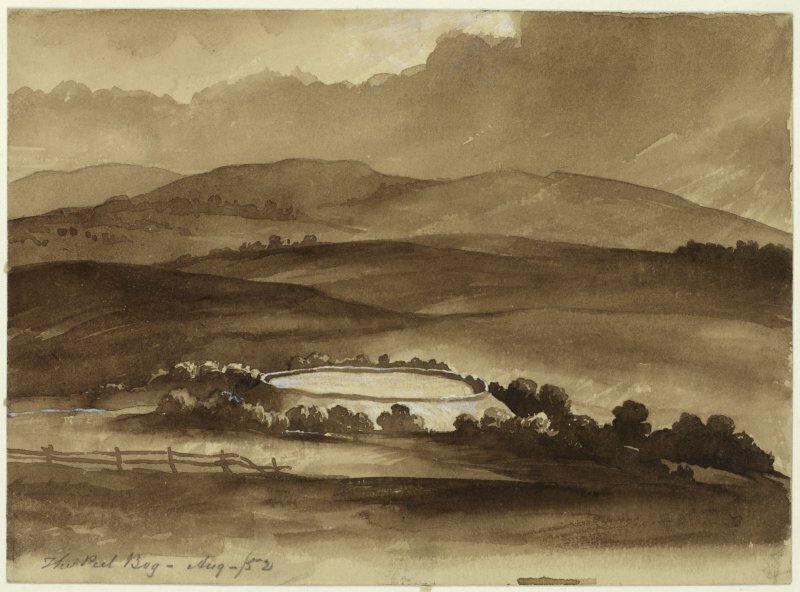 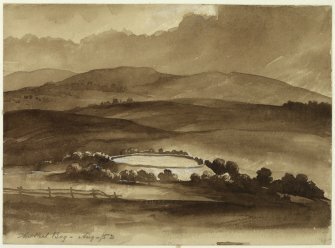 Drawing of Peel Bog of Lumphanan. 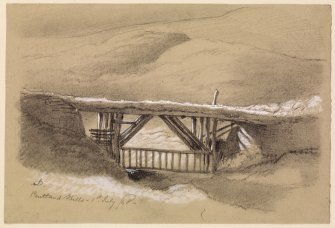 Drawing of bridge in the Pentland Hills. Drawing of Egyptian and Oriental sculptured figures. 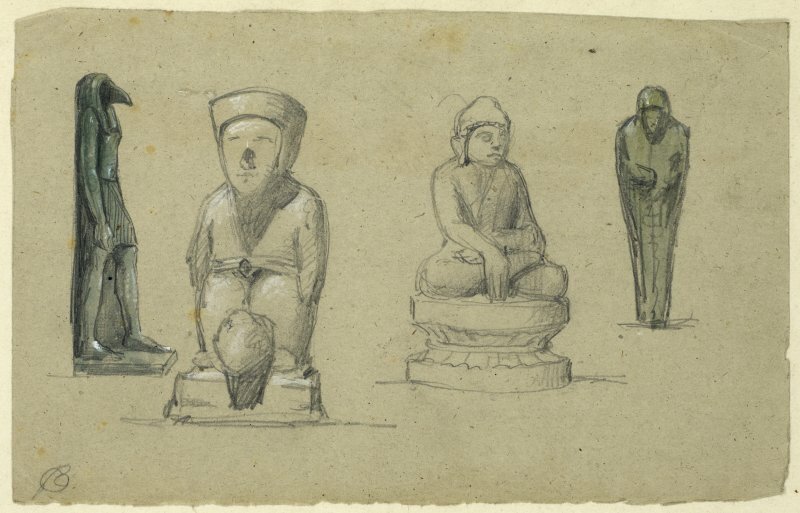 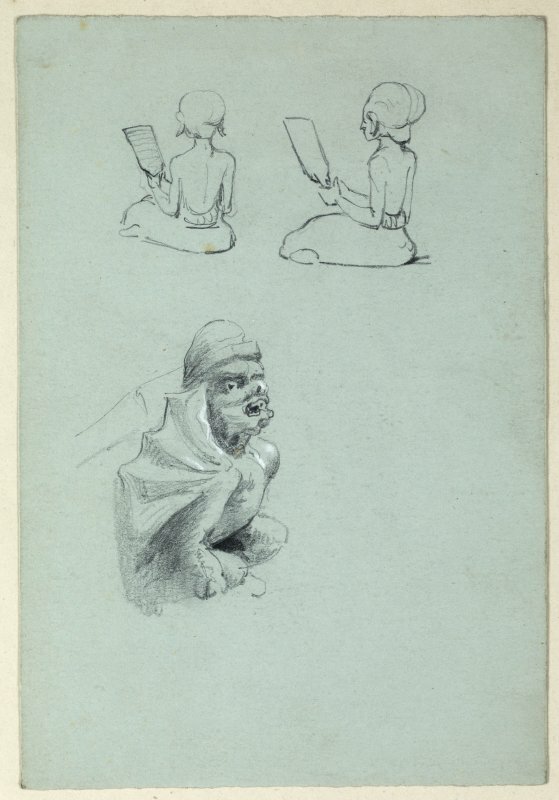 Drawing of seated figures and gargoyle (possibly from Trinity College). Drawing of Egyptian and Indian sculptured figures. 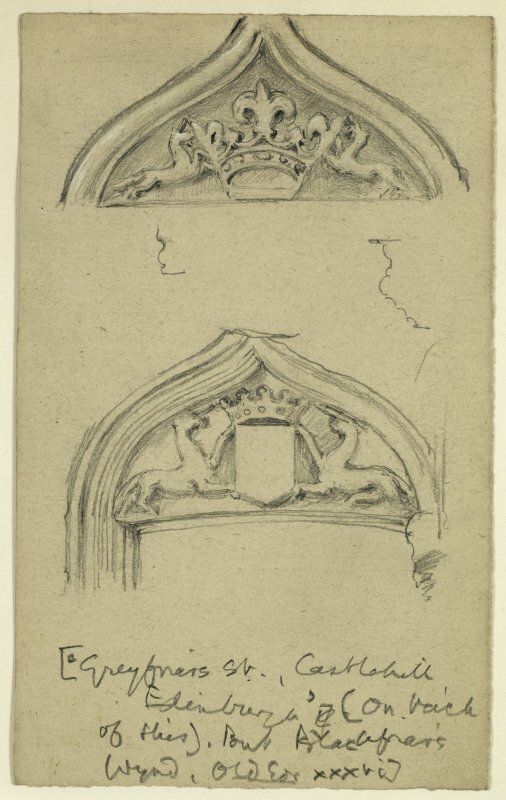 Drawing of details and sections of two doorheads. 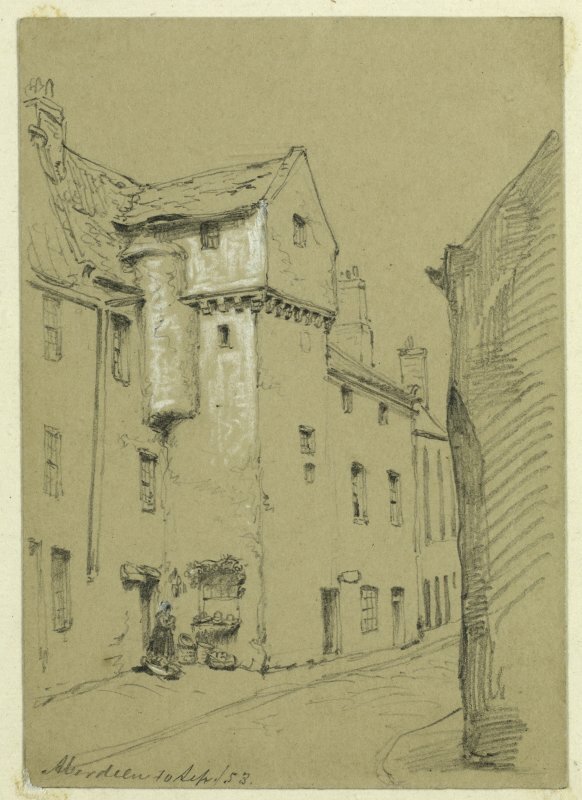 Castlehill, Greyfriars Street. 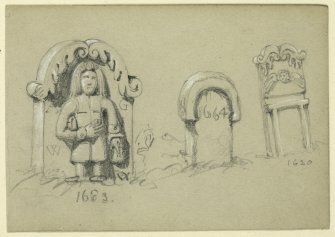 Drawing of grave slab at St. Helen's Chapel. 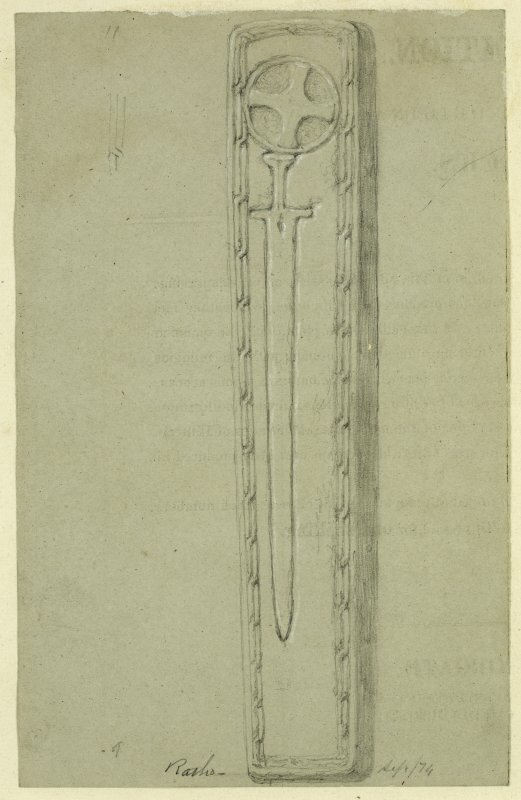 Dedication page to the Antiquaries. 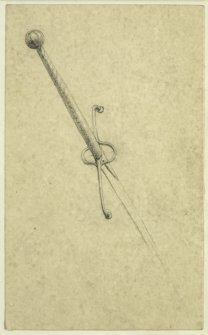 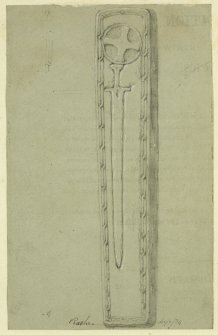 Drawing of a sword hilt. 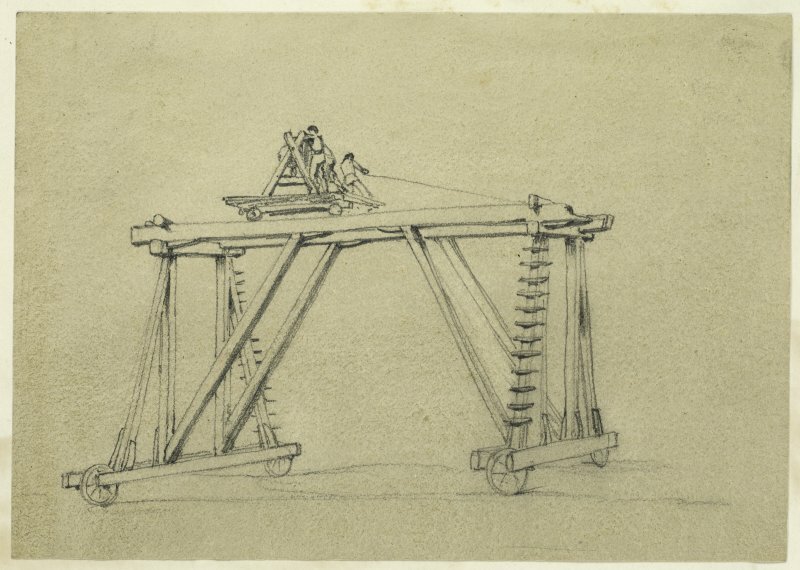 Drawing of a siege weapon. 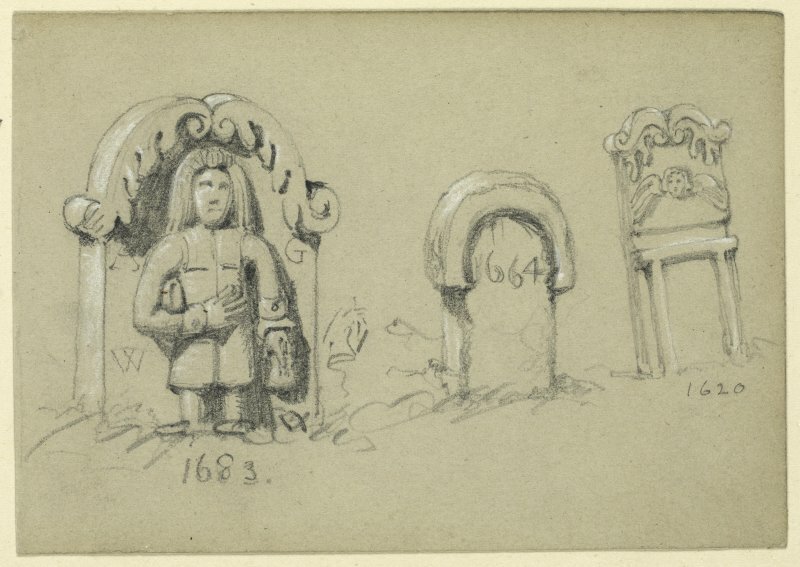 Drawings of gravestones at an unidentified churchyard. 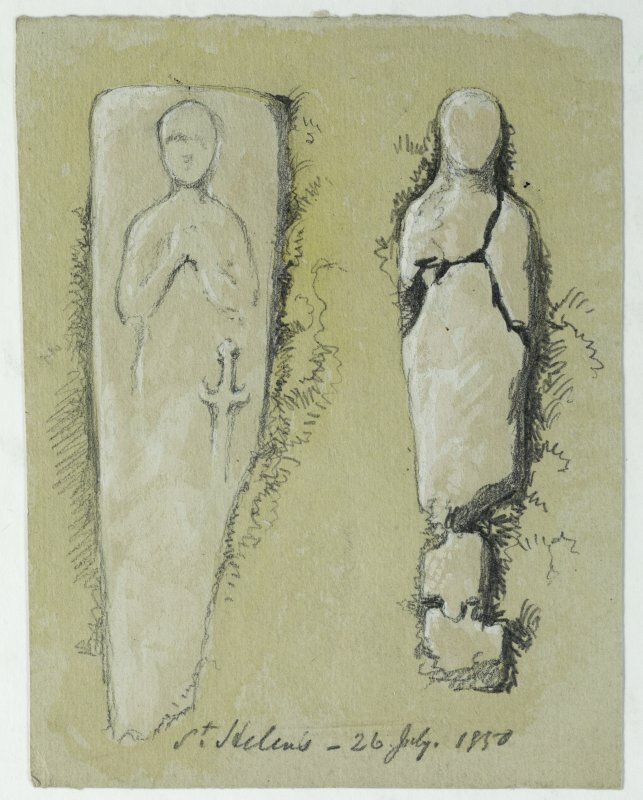 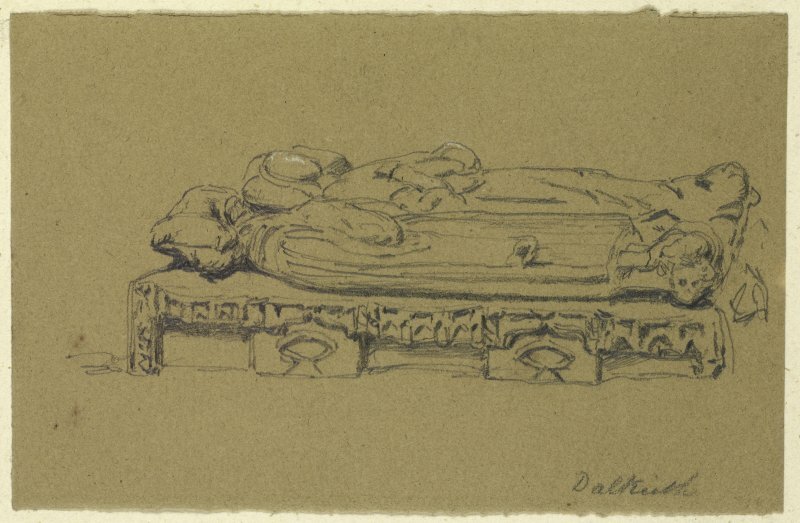 Drawing of a sculpted grave slab (recumbent female figure) at Culross Abbey. 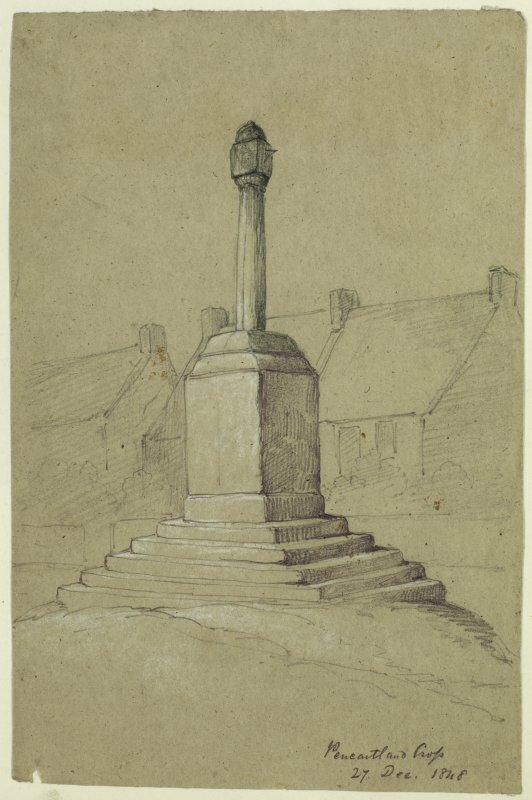 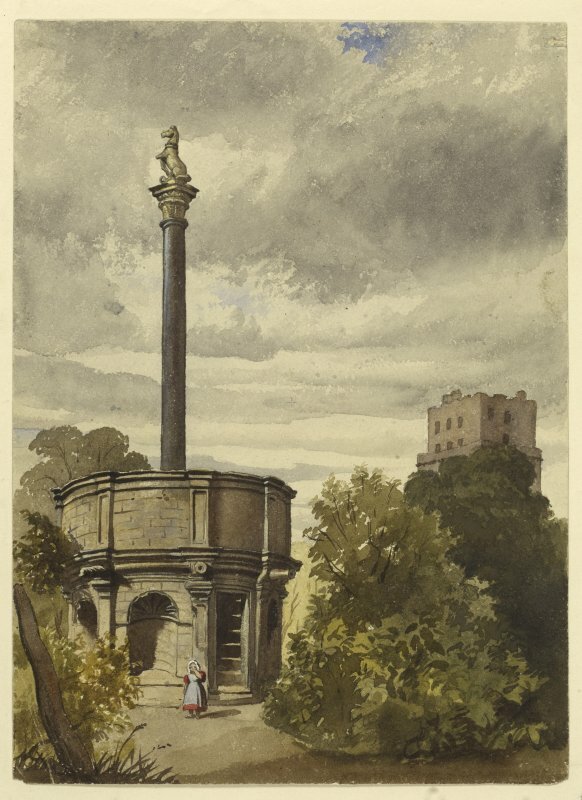 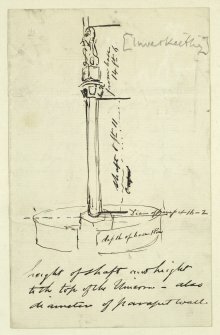 Sketch of Morton monument at Dalkeith East Kirk. 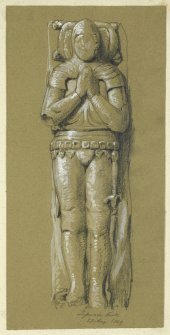 Drawing of a grave slab with recumbant Knight with sword by his side, hands together in prayer at Lasswade, Old Parish Church. 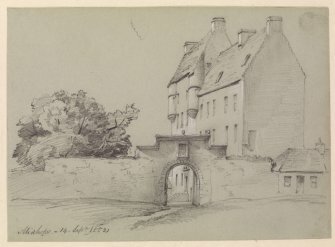 View of projecting staircase in Alloa. Drawing of Low Causeway, Torryburn.